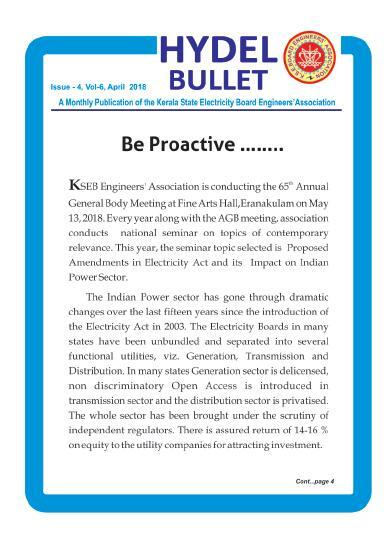 KSEB Engineers Association had celebrated the day by conducting seminars,workshops and other activities at all district centres with a large participation of fellow engineers and by inviting eminent engineers to share their experiences and to talk on the selected theme. 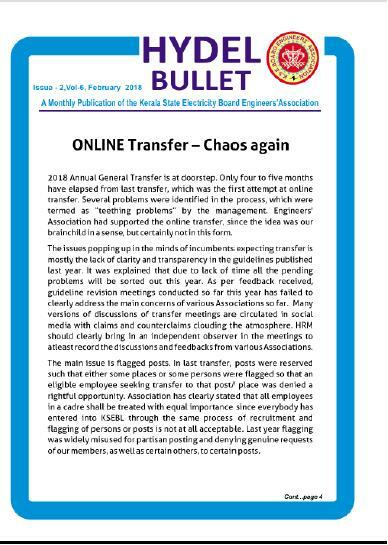 Since our organisation is a government public sector utility, they are under the impression that by bullying our officers they create a public image that they are quite neutral and is working for public interest. The circumstances that warranted the sudden formation of these two posts needs to be looked into seriously by one and all. It definitely points to some hidden agenda behind the whole episode. The Association which widened the orbit of its activities, has passed through both pleasant as well as inclement weather. 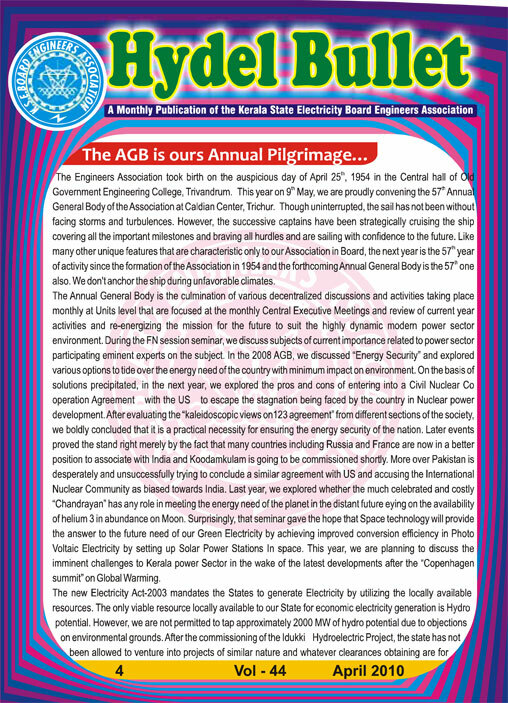 As an Association, we have grown leaps and bounds. Also finding funds for creating new capital in the form of lines and towers is a big problem which requires a huge package for land compensation. But there is a solution for this conundrum. These towers can be setup on a PPP mode where by other utilities can also share the towers. The existing towers can also be given to other utilities on a chargeable basis and the charges so obtained can be used for new capital works. 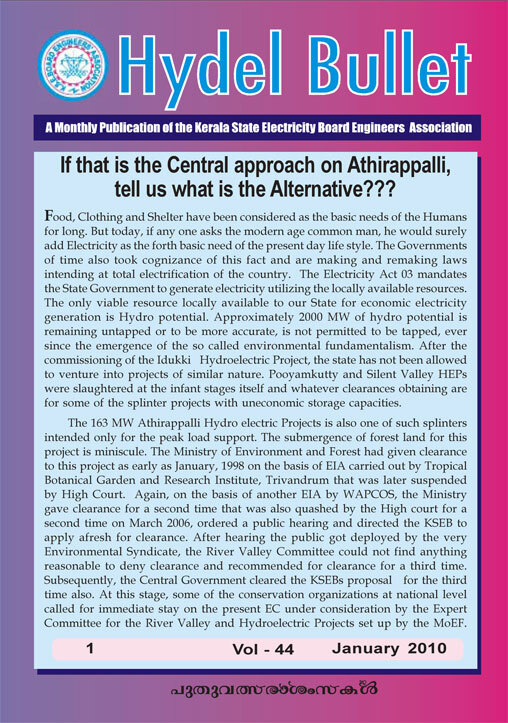 The idea of the Pallivasal project was conceived in 1930s when the power from the Diesel electric plant established in 1928 in Thiruvananthapuram was no longer sufficient for meeting the emerging power needs. 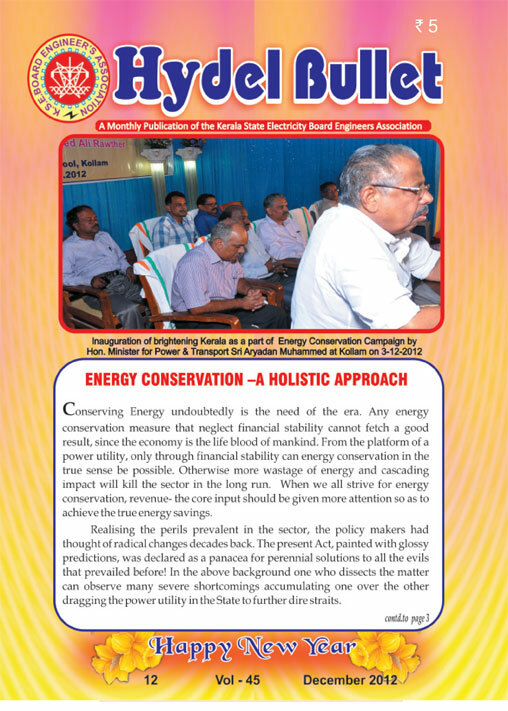 Kerala has a dominating presence in the energy conservation scenario. 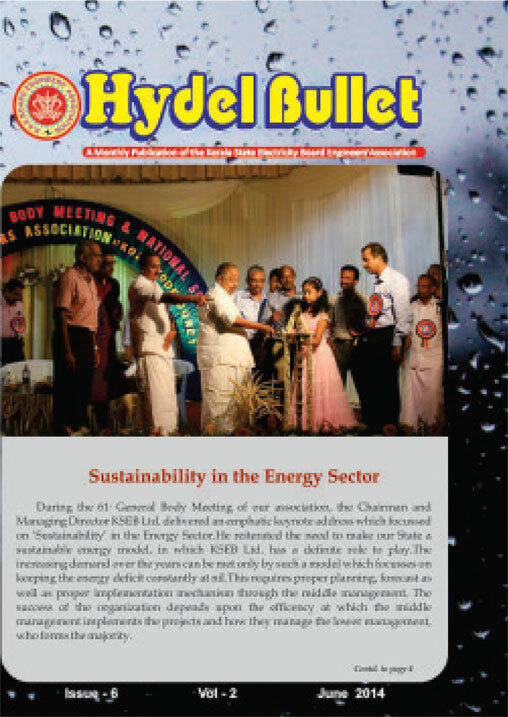 In Kerala, there are many organisations working in the field of energy conservation including the Government agencies like ANERT and EMC. 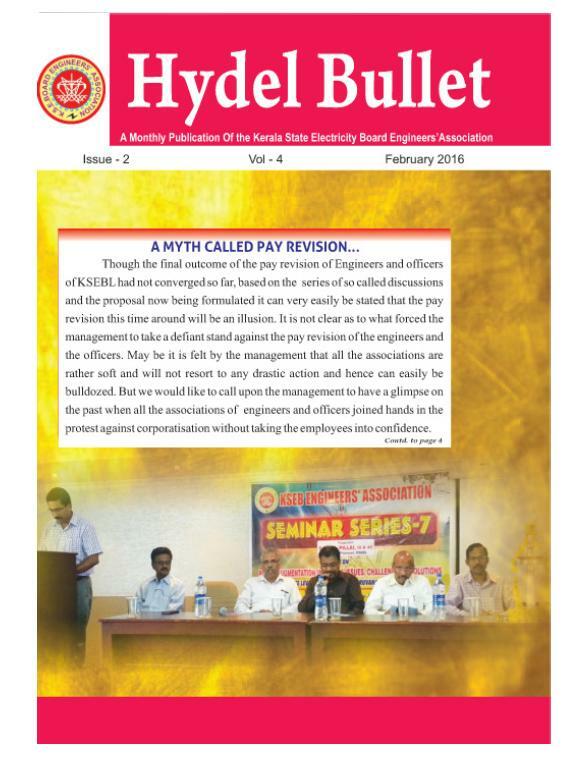 relations prevailing in this organisation will take a back seat and the management will have to face the wrath of the employees which in turn will affect the general public also. 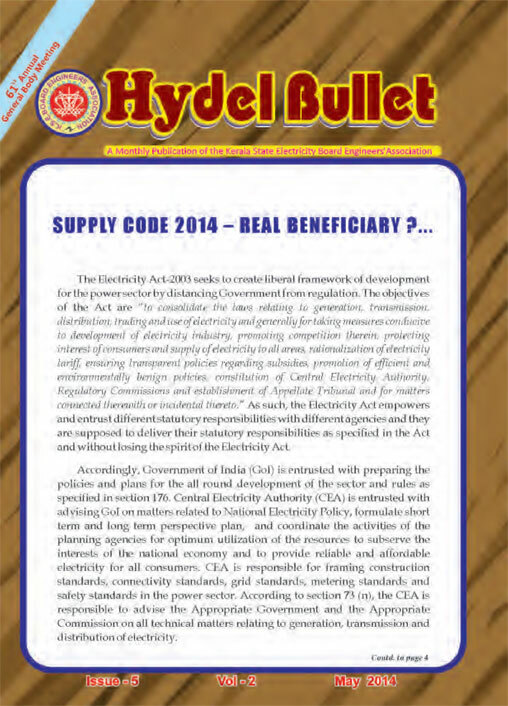 under this section, enabling the continuation of the cost plus tariff structure. 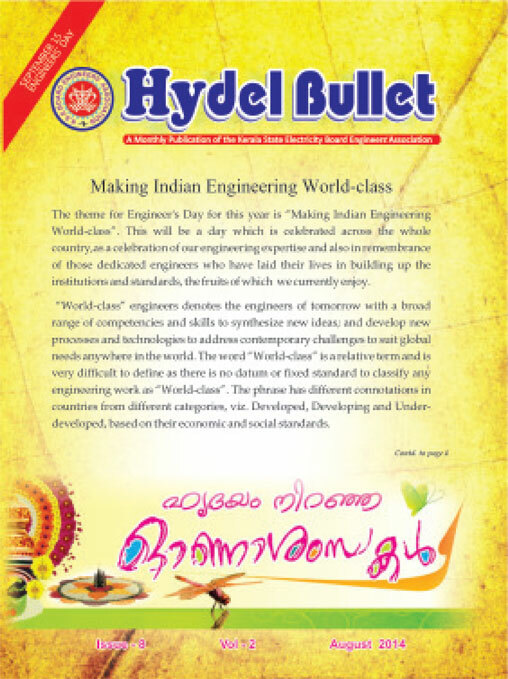 However, the engineers, who are the harbinger of development of any country, always strive for enrichment of their knowledge and skill to upgrade the quality of life and their performance. The pursuit for betterment is a continuous process. 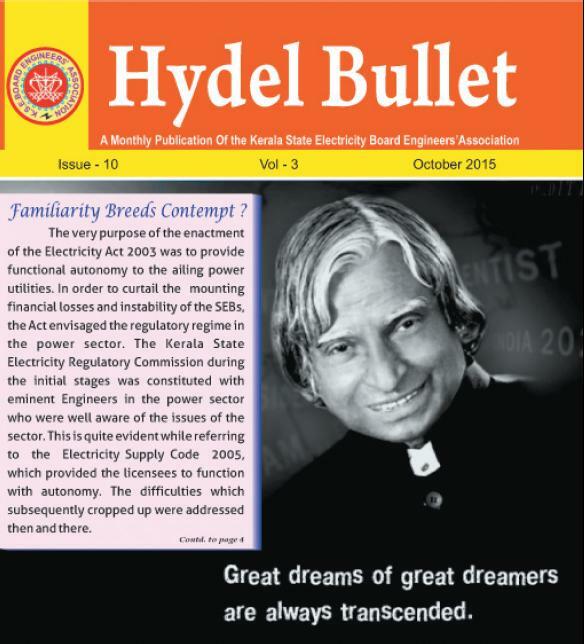 There is no end to development and engineering progress. 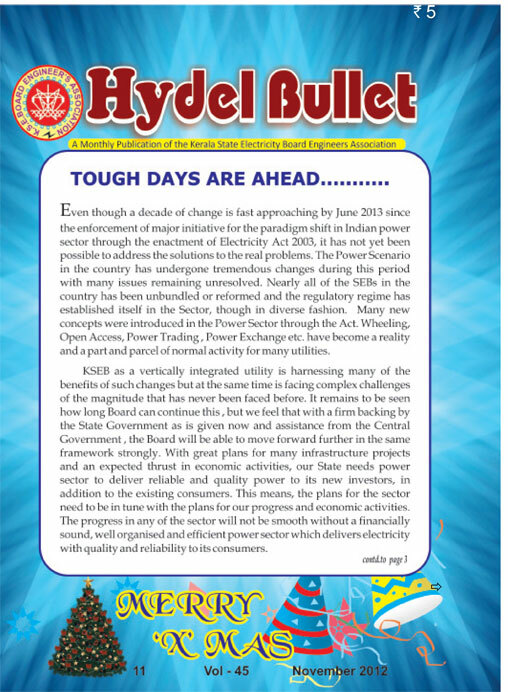 The process of upgradation from one standard to the other, is a continuous process, which is led by the engineers after taking into account the prevailing socio-politico economic conditions of the country. 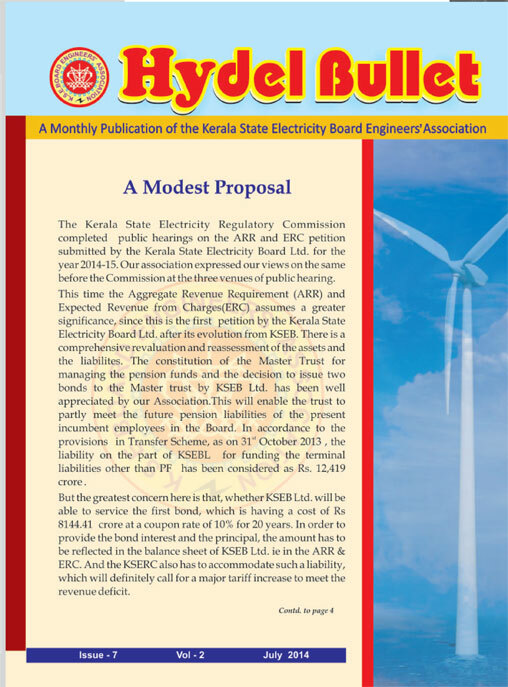 But this time, KSEB Ltd. has neither shown the depreciation of the revalued asset cost of Rs 4000 crore nor the principal payback of Rs 8144.41 crore in the ARR statement, inorder to avoid the tariff shock to the consumers. 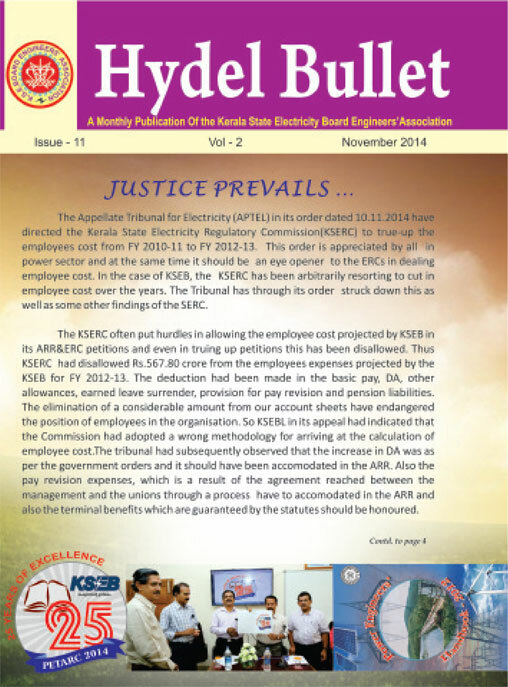 The annual contribution to the Master Trust for the year 2014-15 amounting to Rs 101.12 crore has been included in the employee cost. 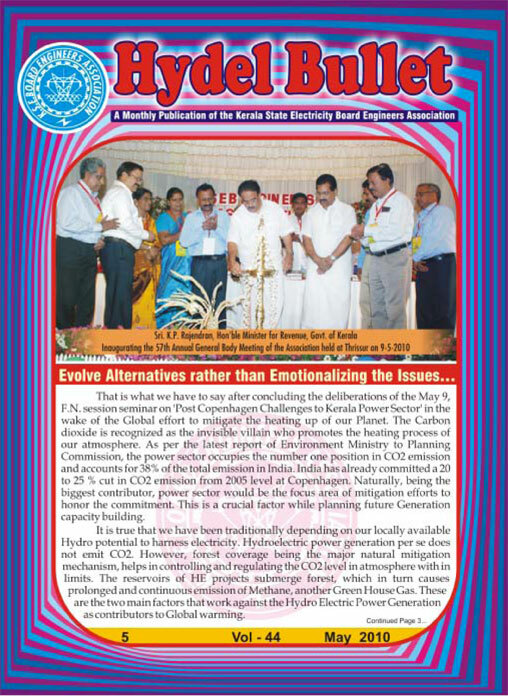 The word sustainable development has become a dominant terminology, after the publication of the UN appointed Brundtland commission Report “ Our Common Future” in 1987 which dealt with the increasing degradation of the environment. 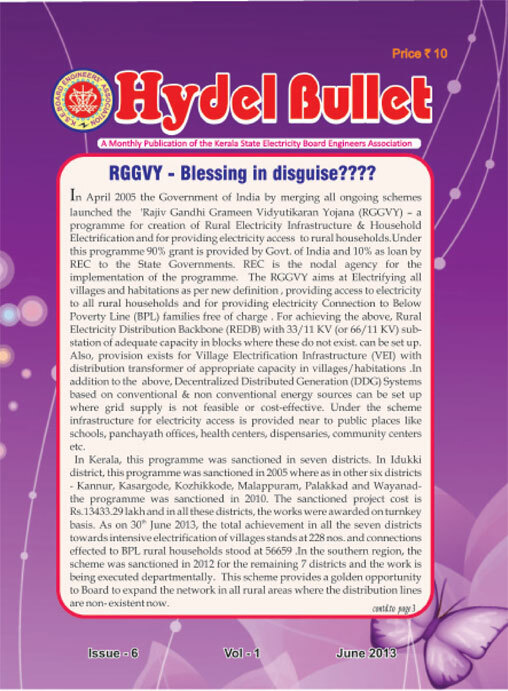 Similarly the functions of CERC are specified under section 79 and that of SERC under Section 86 of the IE Act. 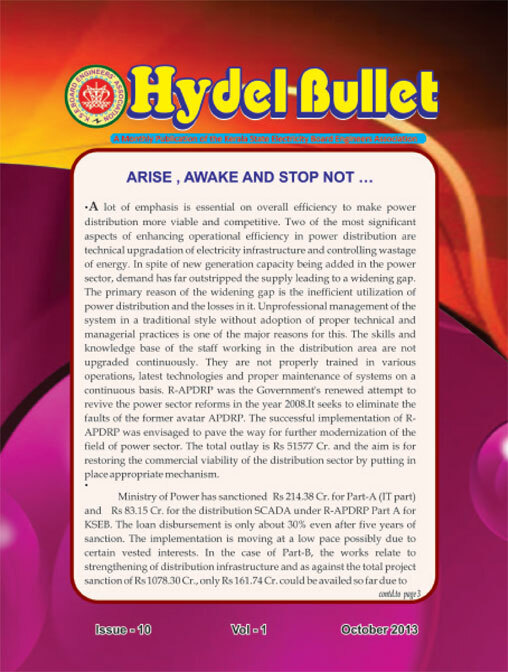 According to Section 86( 3), the State Commission shall ensure transparency while exercising its powers and discharging its functions and Section 86( 4) says “in discharge of its functions, the State Commission shall be guided by the National Electricity Policy, National Electricity Plan and tariff policy published under section 3” The Electricity Act, National Electricity Policy and Tariff Policy ensure and stress the financial viability and financial security of the licensee for delivering its duties and responsibilities entrusted to it. 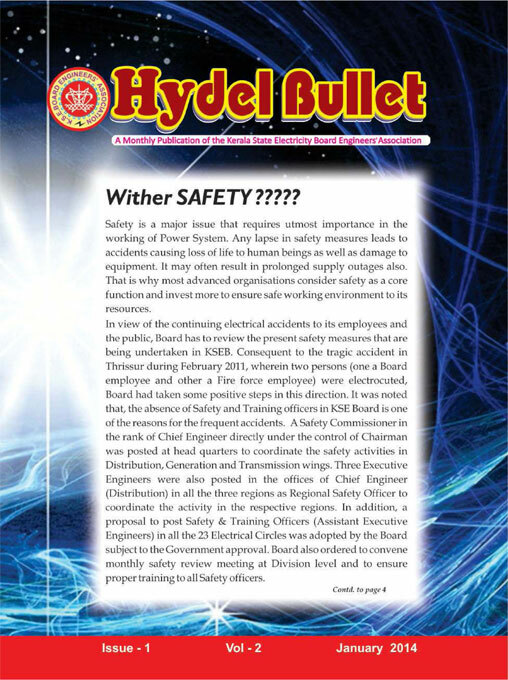 control of the regional safety officers to conduct surprise field inspections and find out the real cause of each of the accidents. 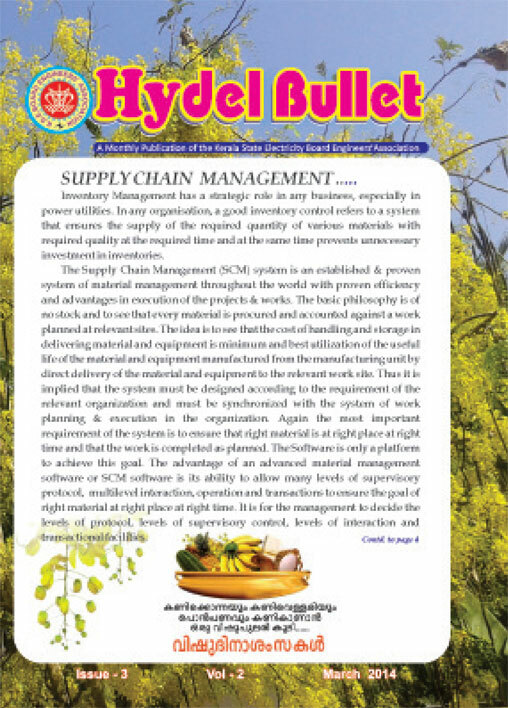 Before implementing any new system in our organisation, the in and out of the new system should have been understood properly as well as the strength and weakness of existing system should have been properly considered. 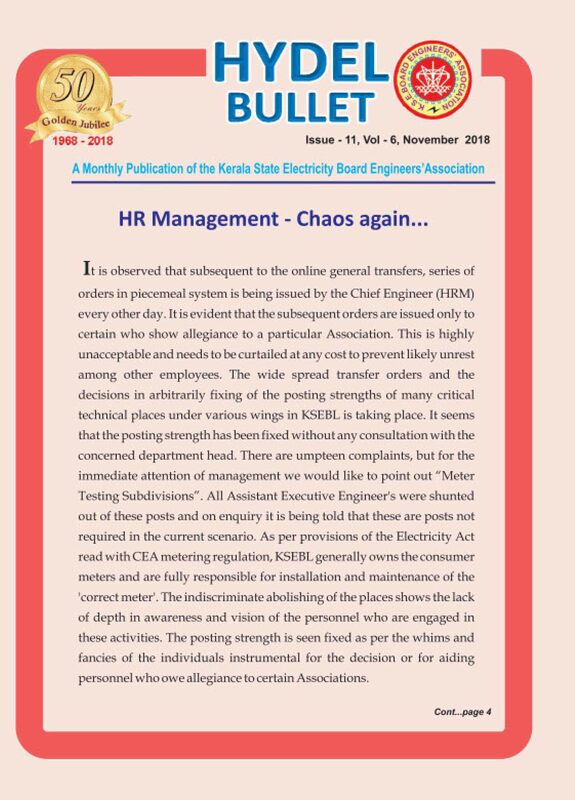 The level & competency of employees who are supposed to handle the system and the best way to implement the system in our context without much inconvenience should have been ascertained properly. 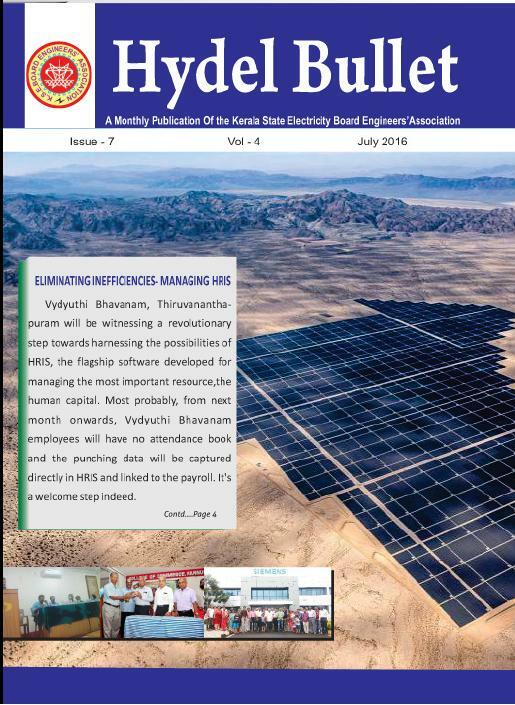 As per the regulations, the consumers can install SES up to 3 MW and the distribution licensee shall provide the connectivity without any discrimination. Depending upon the capacity of SES, it may be connected to single or three phase LT system or to HT system. 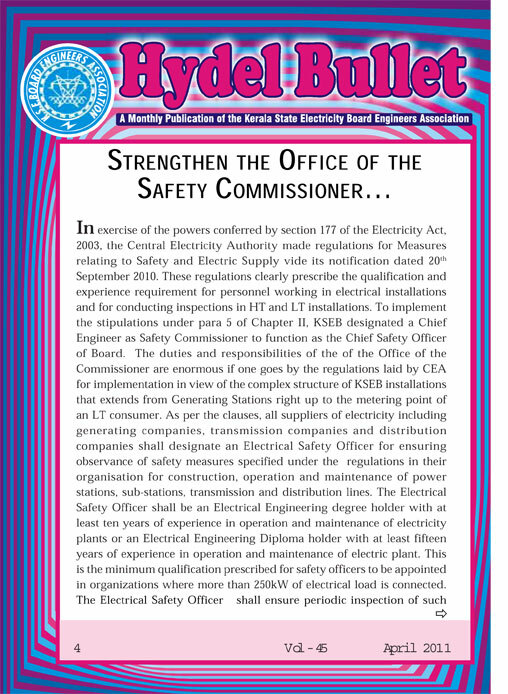 But the draft regulations is silent on the voltage level at which the connectivity is to be provided. 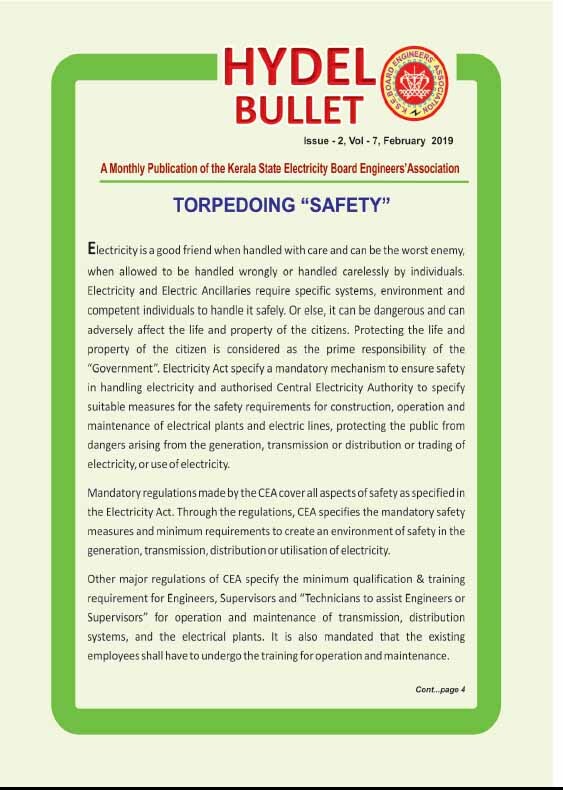 Electricity Supply Code stipulates that the loads 101- 3000 kVA are connected at 11 kV level. forthcoming as is evident from the continuing accidents. Whenever accidents happen, the concerned come up with some sort of excuses, often not revealing the real facts that lead to the incident. 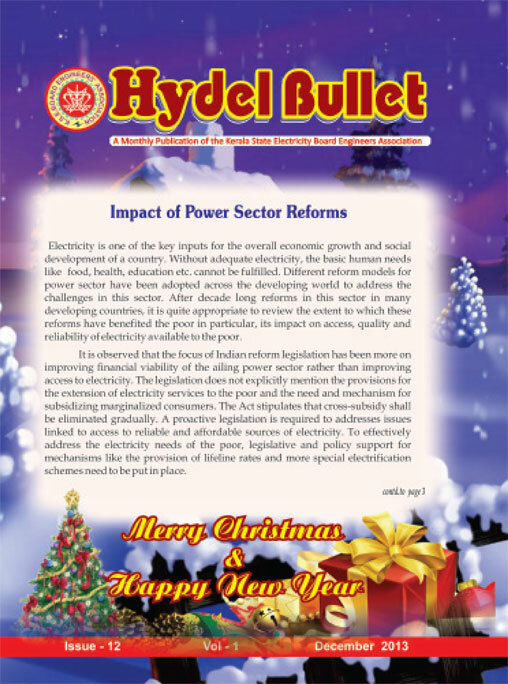 To assess the impact of power reforms on the poor, it is essential to have separate indicators for poor and non-poor groups in society. International comparisons of poverty data entail both conceptual and practical problems. As different countries have different definitions of poverty, consistent comparison between countries is difficult. 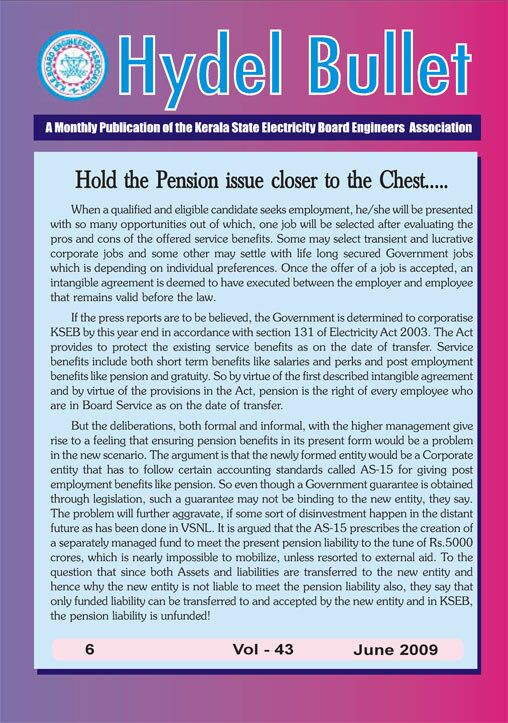 It is only an arrangement by the new company and for that reason the liability for payment of pension and terminal benefits should rest with the Kerala State Electricity Board Ltd only. This is clearly provided in para 5 (a) and 7 of the above notification though para 5(a) requires minor correction. 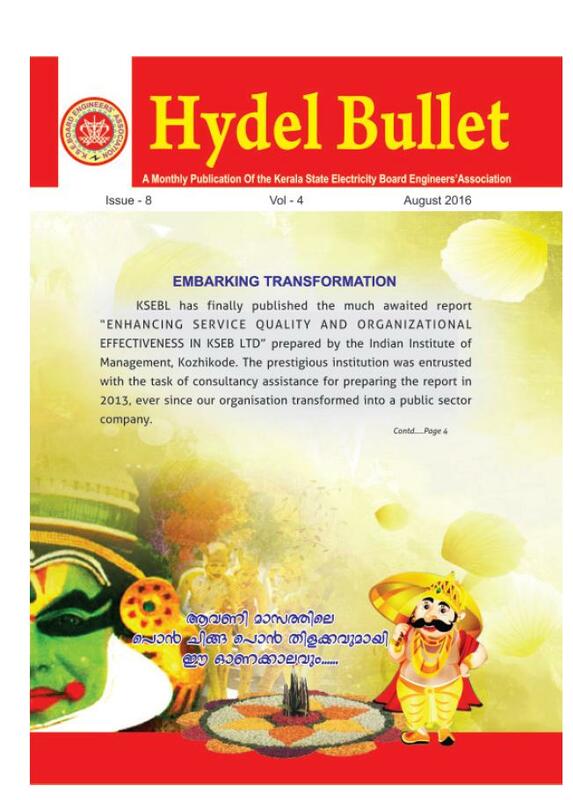 The implementation of IT in KSEB is a story in itself. 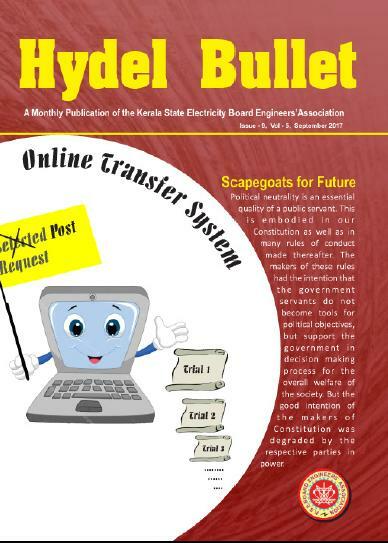 Though KSEB was one of the first PSU, which came forward for implementation of computerization, paradoxically this is the only institution, which has not been able to fully utilize the benefits of IT. 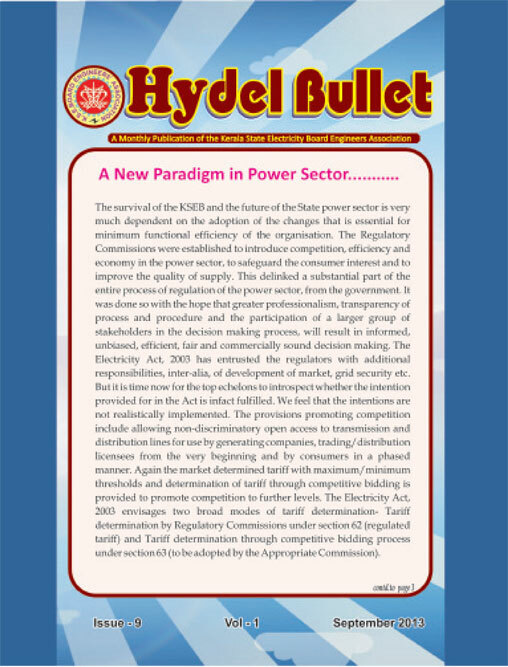 It was realised that the competitive market in power will evolve gradually. 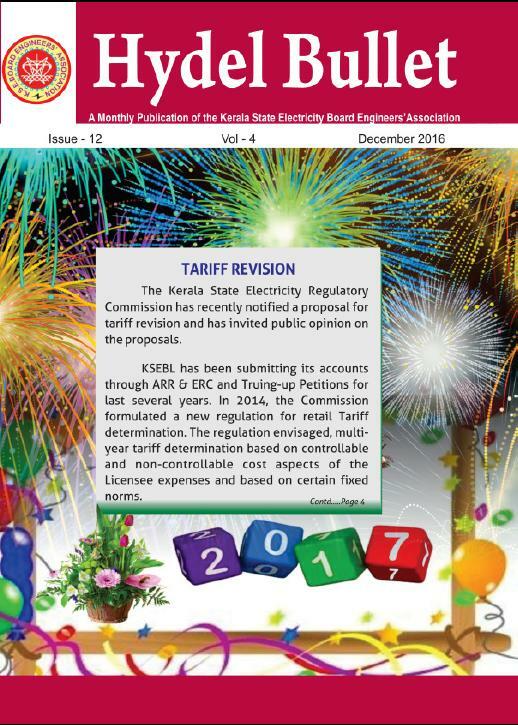 During the intervening period, the regulation of generation tariff will have to be continued on cost of service approach. 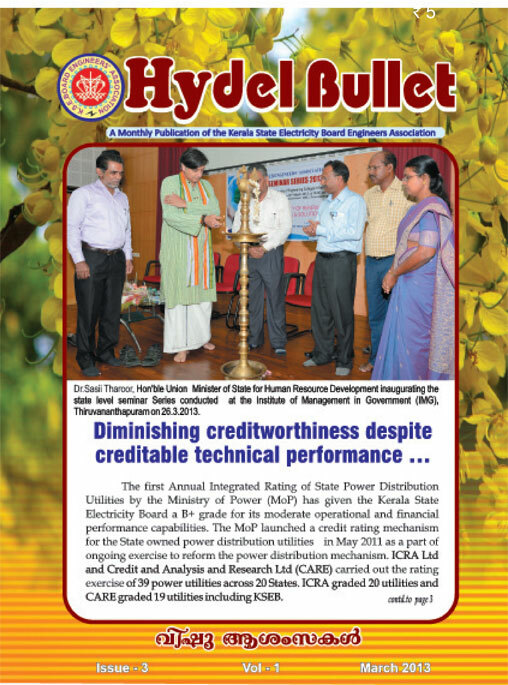 Even under this approach the objectives of achieving economic efficiency and encouraging investment would remain. 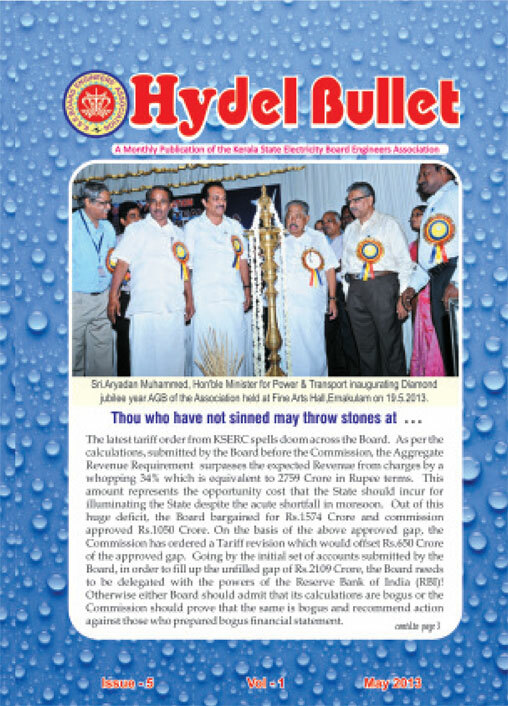 In every ARR &ERC, the Commission denies a certain extent of expenditure claimed by the Board and though the major reason projected is higher employee cost, the matter of fact remains that the Board cannot and will not reduce the employee cost as such and the expenditure incurred by the Board in some other head is affected and in effect the non admitted actual expenditure incurred by the Board starts accumulating as a loss and over the years this mounts to a huge figure due to the passing the buck attitude of the Commissions. 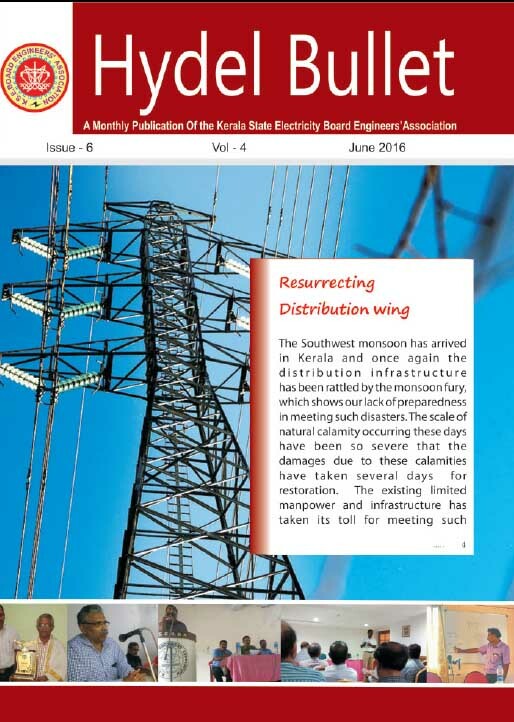 With the adoption of the Kerala State Electricity Supply Code 2005, there is scope for ambiguity in the procedures regarding the registration of domestic service connections. 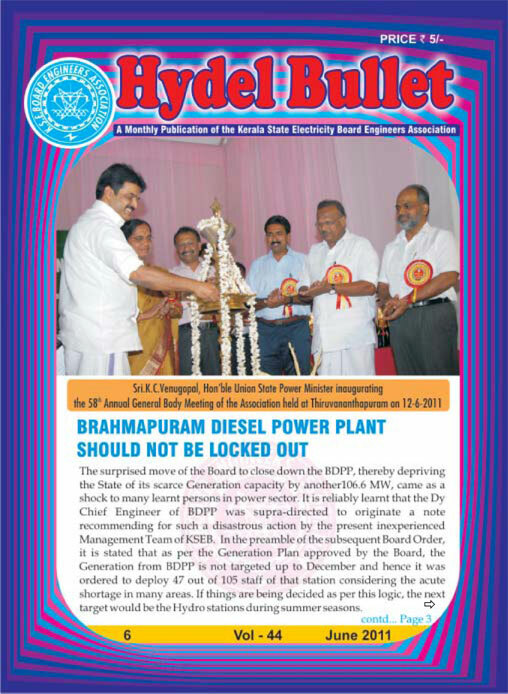 The total electrification programme (“Sampoorna Vydyuthi karanam”) launched by the previous Government was its flagship programme. 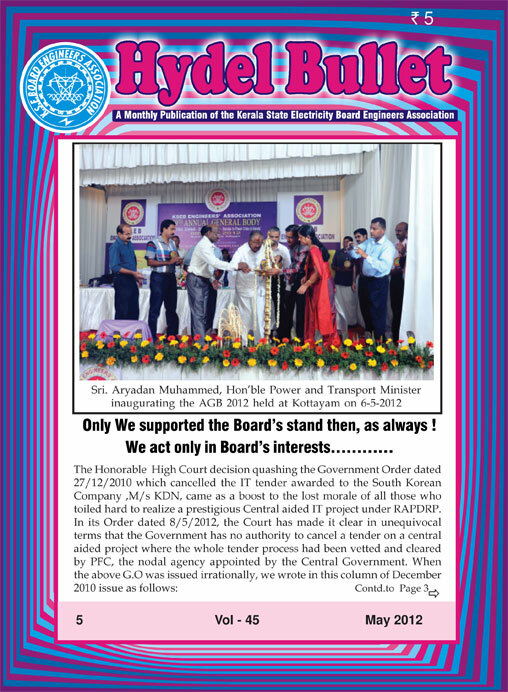 It is a fact known to everyone that the widening revenue deficit in Board is due to the increasing component of power purchase cost. 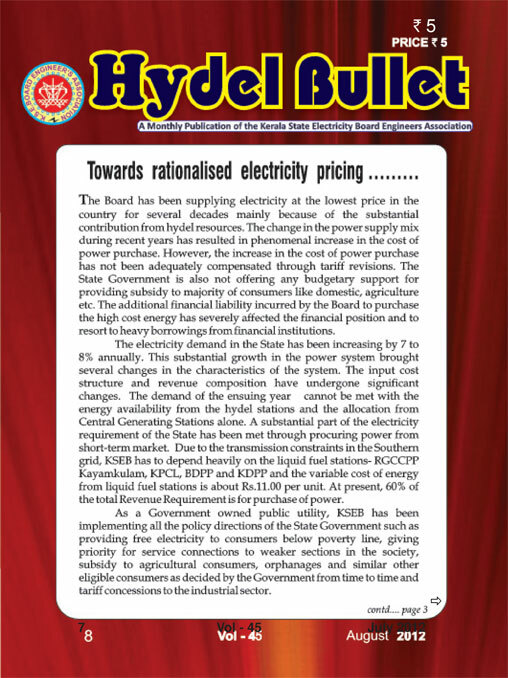 The quantum of power purchase increases due to continuous rise in demand for energy @ 8% per annum whereas there is no corresponding incremental rise in internal generation. 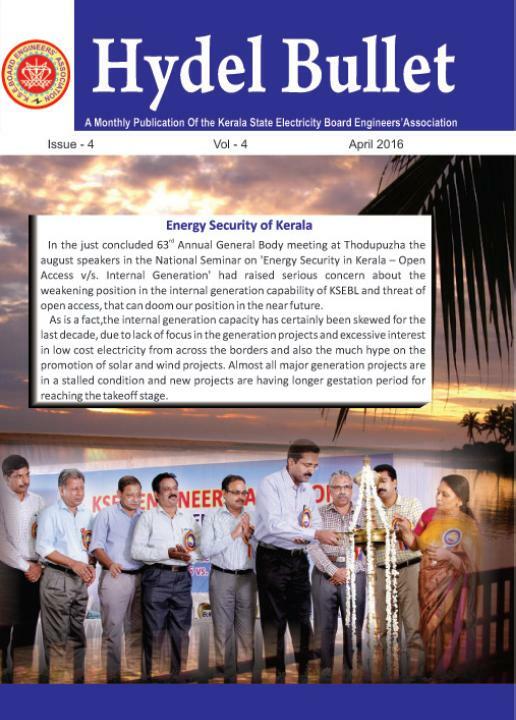 In the minds of many Engineers of the erstwhile Travancore Cochin Electricity Department, there was a desire to form an Association, to bring them together for better intimacy and fellow feeling. 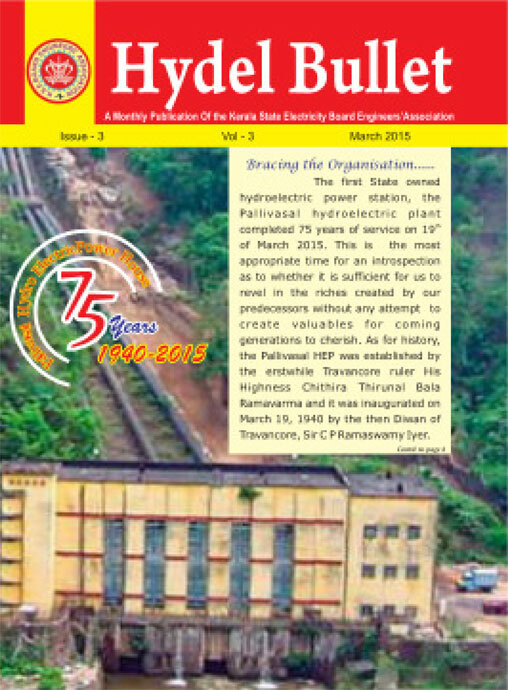 Thus the Engineers in a meeting held on 19th April 1953 evening at Power House premises, Thiruvananthapuram elected an dhoc committee to form an Association after obtaining Government sanction. The ‘integrated ratings’ are on annualised basis and spread from A+ to C. A highly rated distributor will be eligible for funds from State-owned banks and other financial institutions at a lower rate of interest. 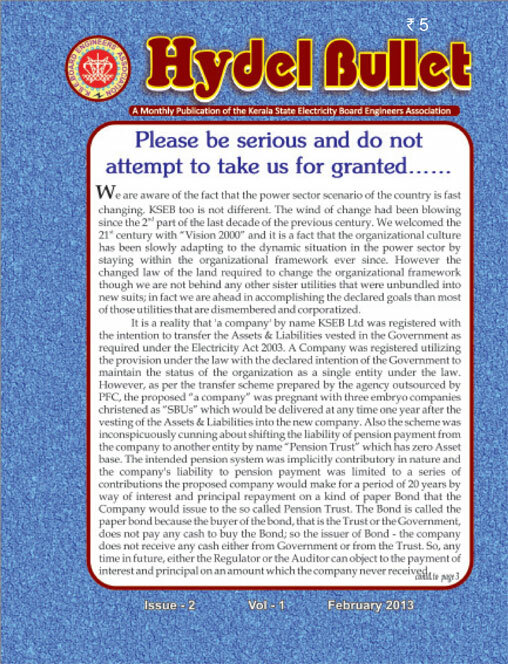 The system has been instituted at a time when the Government planned to bail out debt-laden power distributors by recasting their short-term borrowing. 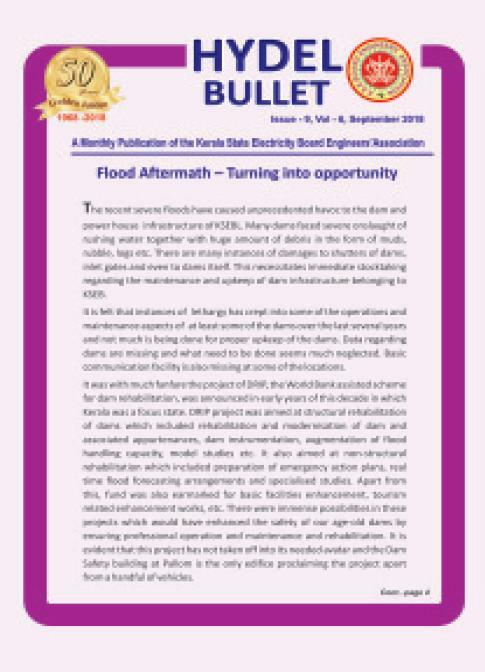 We had clearly made known in writing our apprehensions about the workability of the proposed pension fund and the danger of trifurcation hidden in the transfer scheme. It was clearly pointed out with material evidence that although the Board is corporatized, it is still possible to continue the present practice of giving statutory pension under “defined benefit plan” as provided under Accounting Standard 15 (AS 15) applicable to corporate accounting. One of the issues commonly observed in transfers in Board is the shielding from transfer garnered by a minority group citing expertise in some field. 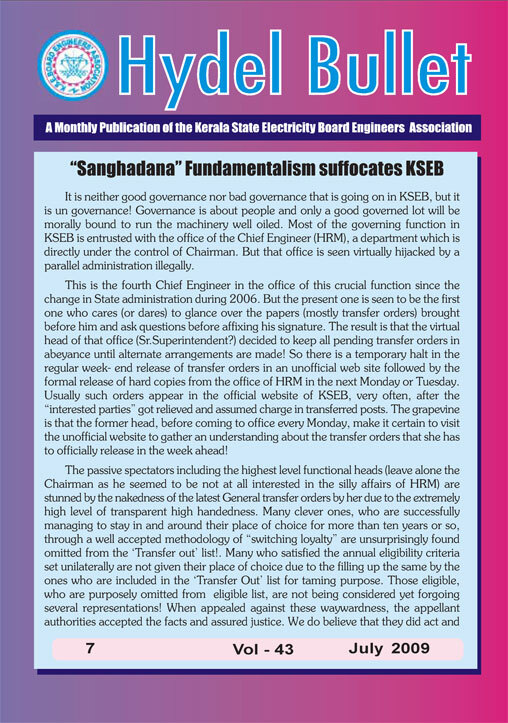 But in reality we feel that since all the functions in KSEB are being handled by a team, nobody is indispensable for any post and the transfer of any particular person should not affect the function of that office.If any particular HOD insists that he / she cannot function in the absence of a particular person in his office, it speaks of the inefficiency of that particular HOD, which needs to be handled accordingly by the management in the wider interest of the organisation and the State. and downstream side filled with lime surkhi concrete as inner core. Later, in an effort to strengthen the Dam, a concrete shield of 10 metre thickness was added to the downstream side of the old dam during1980. 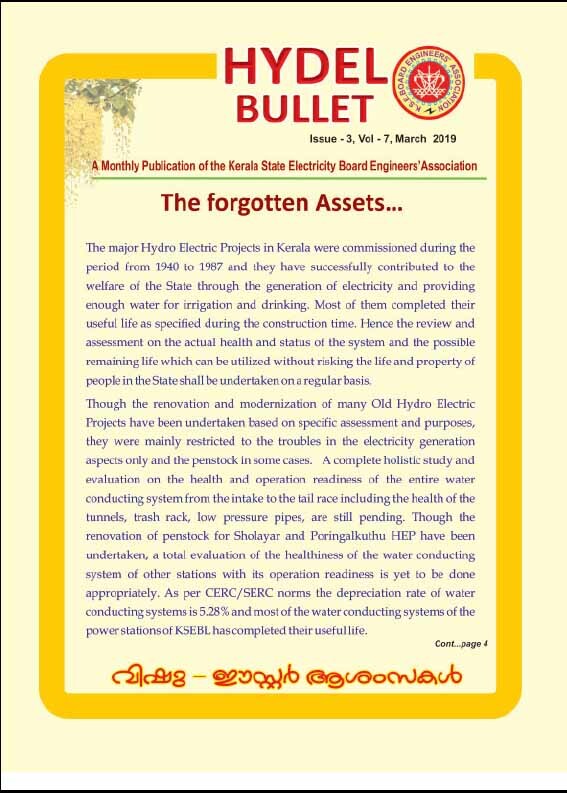 Energy crisis and consequent financial crunch in the Board is not an overnight development and is well documented in numerous records available in the institution. 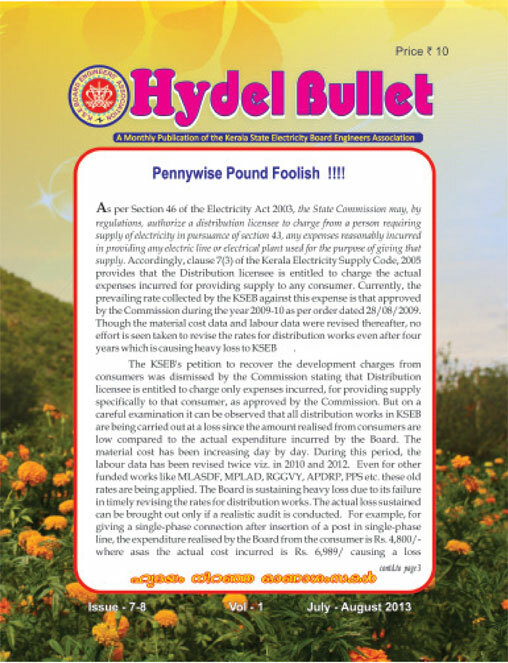 Disharmony in the consumer growth and their consumption with the sluggish or rather stagnant capacity addition has already showed its adverse effects and will eventually snowball into a huge blow, unless corrective measures are initiated without any further delay. 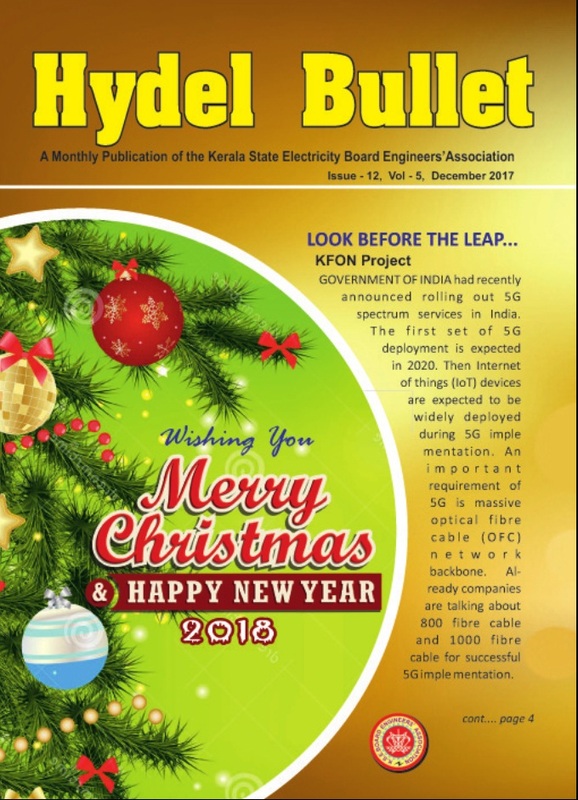 With the highest level of dependency of Kerala grid to the southern and national grid, the widening gap between availability and demand in the Indian Power Sector is an area of concern. 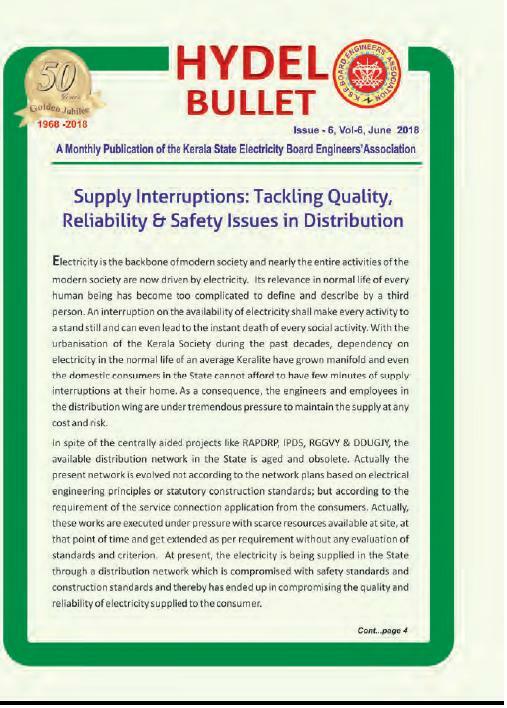 At present this issue is further aggravated with corridor availability problems and coal availability issues. 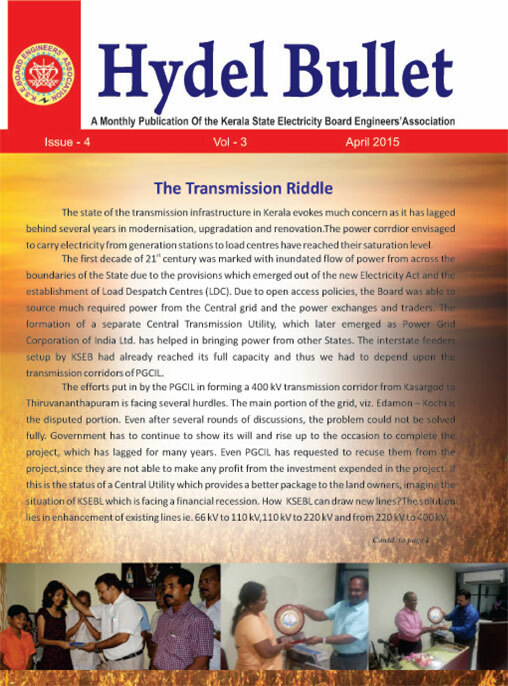 It is well known to all that no works are started in transmission without observing the procedures and formalities. Work bills are prepared, measured, verified and check measured at various levels before forwarding to accounts branch at ARU. Further, technical audit and financial audit are conducted by the concerned teams at ARU and the bills are passed only after clearing all audit queries. 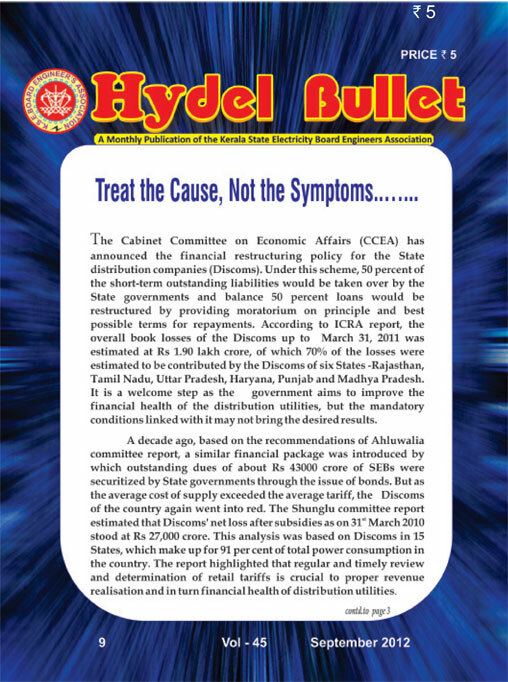 The approved bailout scheme is formulated based on the report of an expert committee headed by Sri. 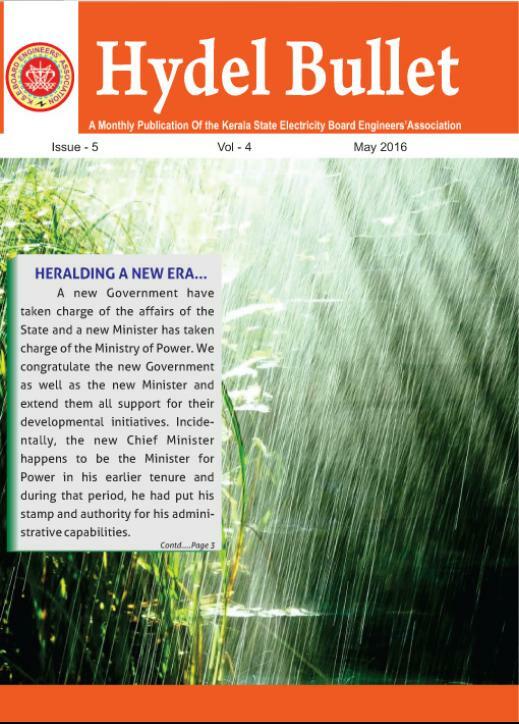 B K Chaturvedi, Member (Energy) Planning Commission. The committee has come up with various suggestions and some of them would be mandatory in nature. 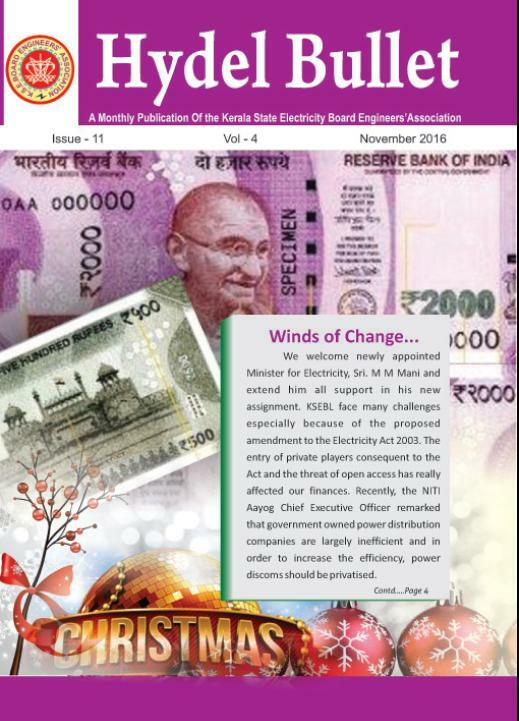 The aim is to make Discoms to take steps for improving their financial health. 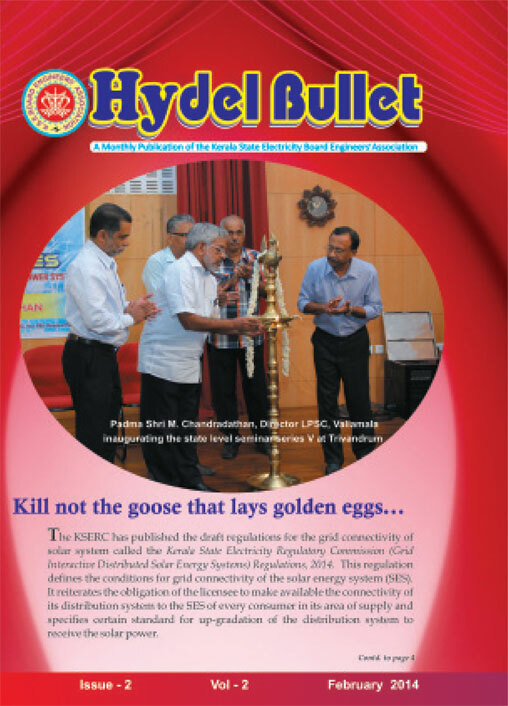 The poor health of Discoms, due to lower tariff regime and high distribution losses, has also raised concerns of possible loan defaults in the banking system. 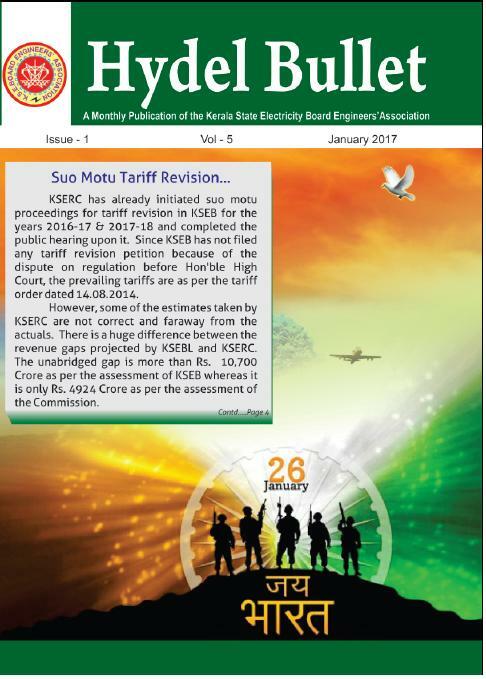 The revised estimates for the year 2011-12 leave a revenue deficit of Rs 2118.48 Crore and the estimate for the year 2012-13 projects a revenue deficit of Rs 3240.25 Crore. 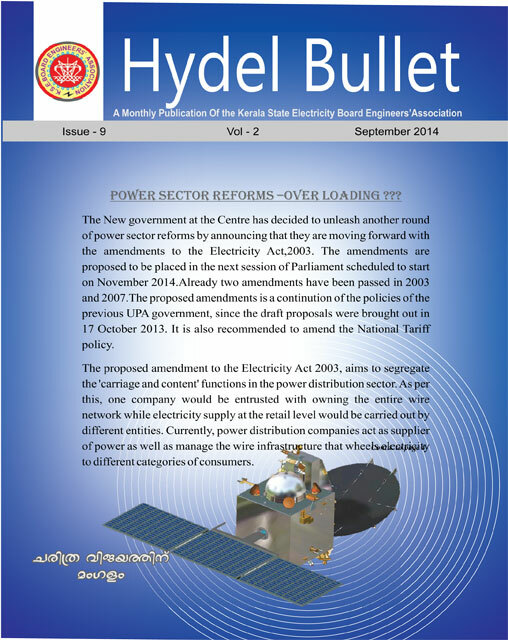 All power purchase costs need to be considered legitimate unless it is established that the merit order principle has been violated or power has been purchased at unreasonable rates. 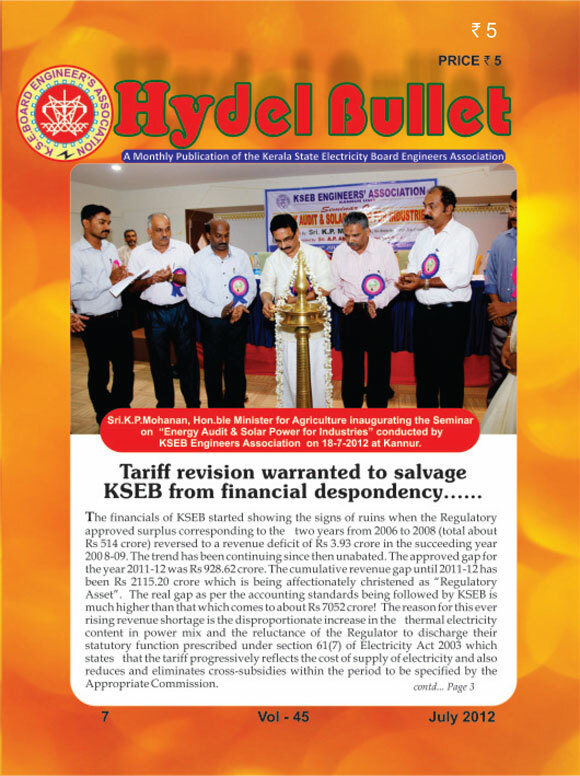 The cost of thermal power purchase consisted 38 to 44 % of total Aggregate Revenue Requirement (ARR) in the three years from 2005 to 2008, which suddenly jumped to 63% of ARR during the year 2008-09. 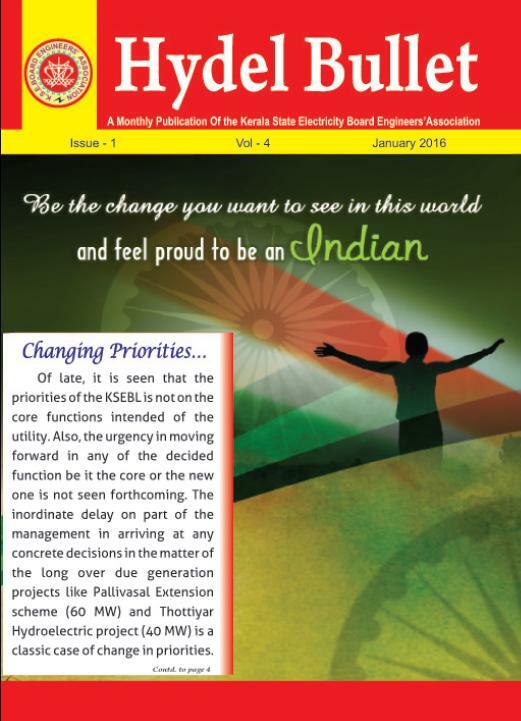 The countrywide increase in demand to cater to the 8%-plus growth trajectory and the inadequate capacity addition caused abnormal increase in cost of thermal electricity. 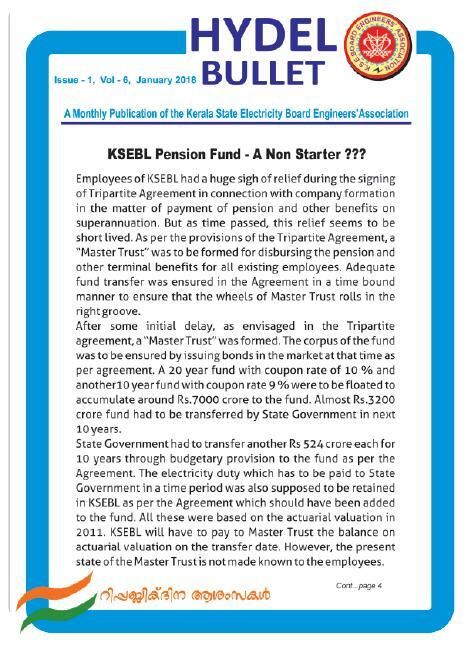 Associations on 15/9/2009, it was disclosed that employee liabilities in respect of both pension and provident fund remain unfunded over the years in KSEB. However provident fund remains accounted, while pension fund remains both unfunded & unaccounted! It was also admitted that before revesting the assets and liabilities in the new company, both these liabilities are to be brought into accounts and funded in the Balance Sheet. 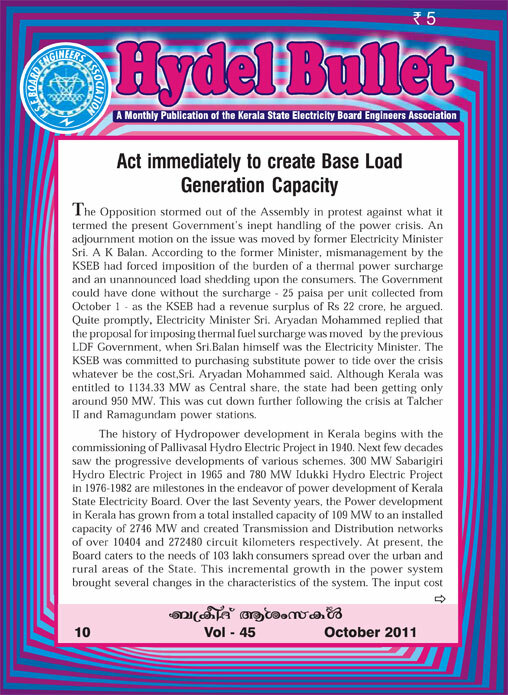 When Kerala State Electricity Board was constituted under Section 5 of Indian Electricity Supply Act on April 1st, 1957 we had a Generation capacity of around 108 MW; scarcity of electricity was not at all an issue then. 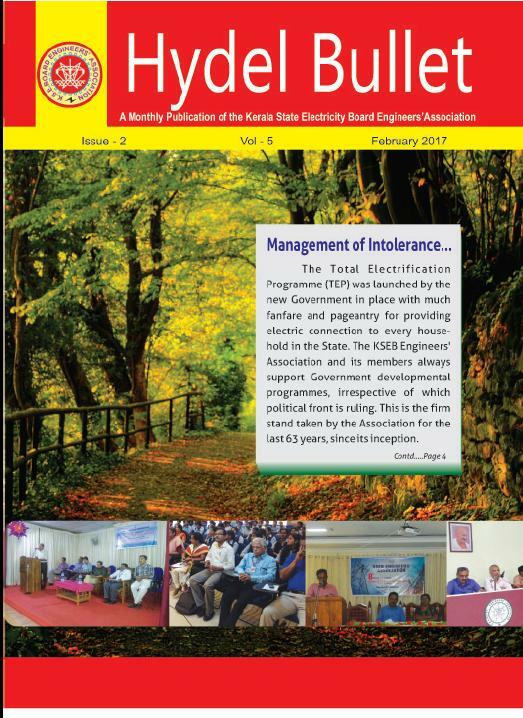 From thereon, the need for electricity gradually grew and in the present day lifestyle, electricity is as essential as any other basic needs of the society. 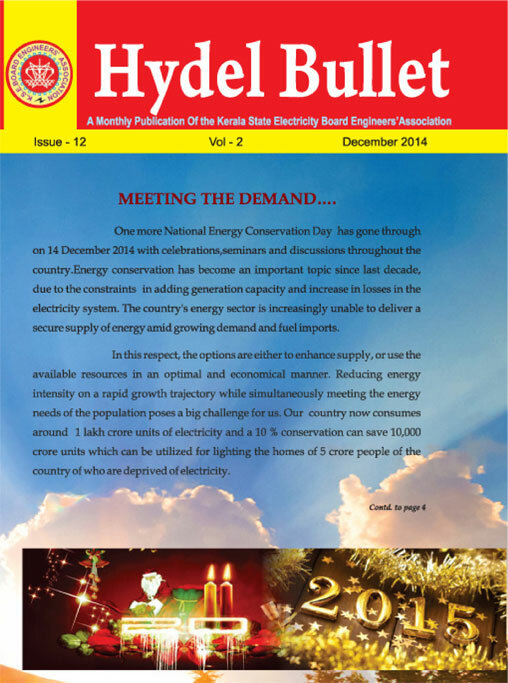 Though the Generation capacity addition also grew, the growth in demand has been outpacing the capacity. 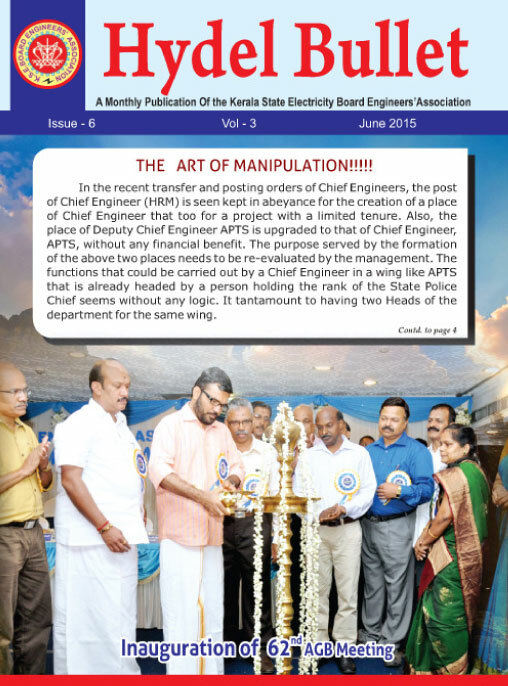 Minister of the State, Shri Pattom Thanupillai, he had not declared then that KSEB Engineers’ Association will function as a Political Outfit. 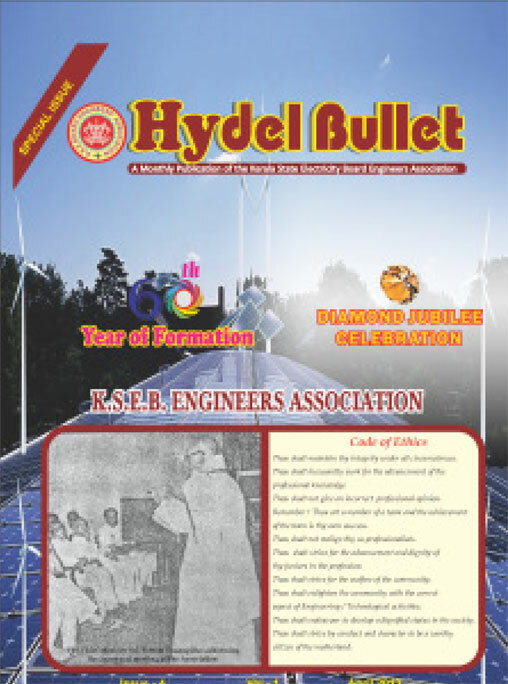 Later on, many prominent personalities from political, cultural, social, judicial, scientific and Engineering fields participated in the various activities and events organized by the Association all these years. When the veteran leader Shri M.N. Govindan Nair was the Electricity Minister, the Association faced the most challenging period in its history including imprisonment of its leaders when strike for the Power Engineer’s Cause. 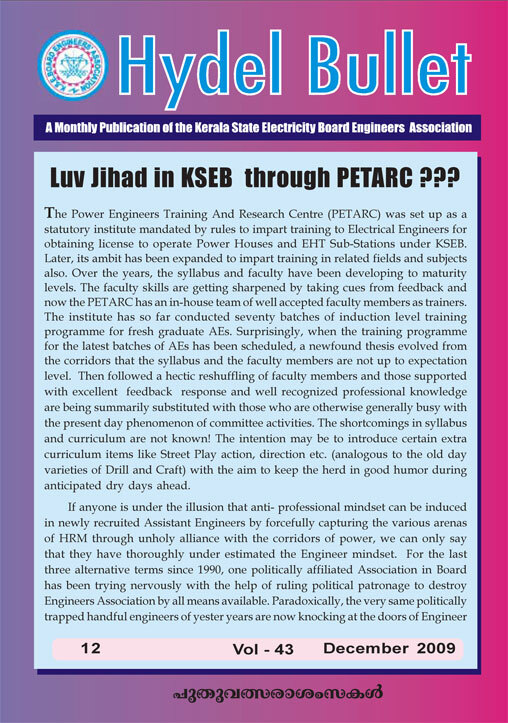 of the 757 Assistant Engineers (Electrical) recruited through PSC during 1997- 2000, about 350 Assistant Engineers are now facing this embarrassing situation. 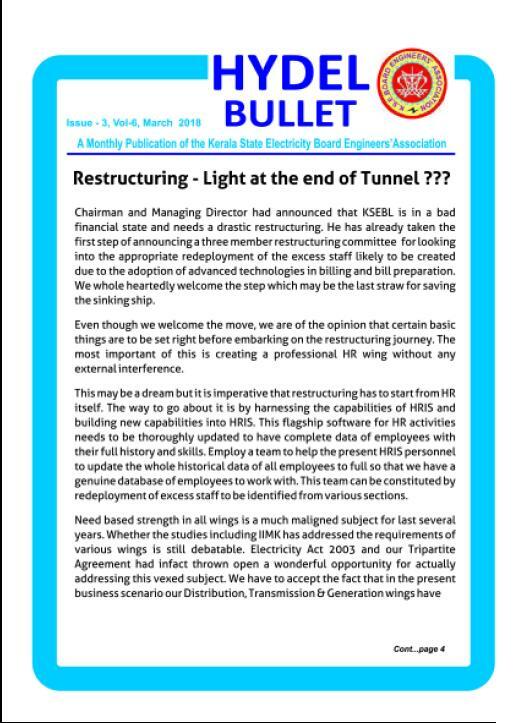 The basic reason for this anomaly is the undue delay in adopting the amendments/revision of Engineering Service Rules. 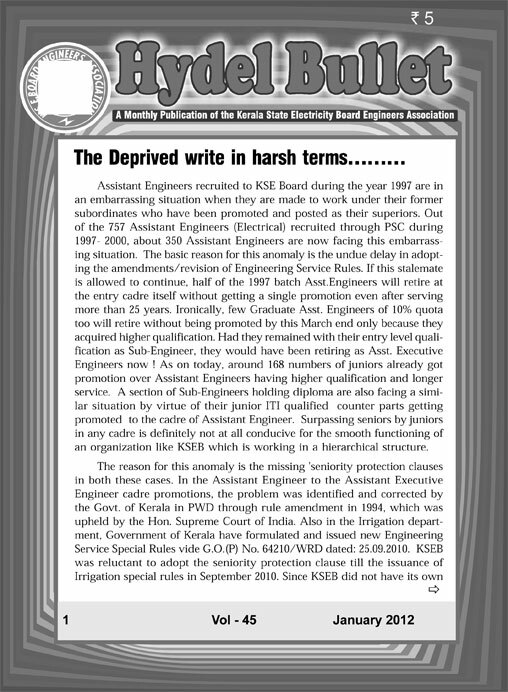 If this stalemate is allowed to continue, half of the 1997 batch Asst.Engineers will retire at the entry cadre itself without getting a single promotion even after serving more than 25 years. The November 22nd Tuesday witnessed yet another fatal accident at heights costing one more precious life. 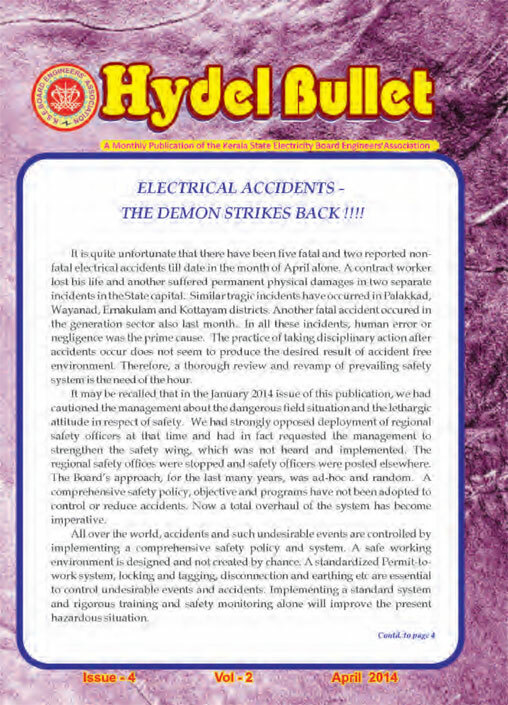 This time the victim happened to be a contract worker who is said to have sound working experience in EHT lines. The accident occurred while he was working in one of the circuits of Lower Periar-Madakkathara (LP-MKA) 220 kV Double Circuit Line. The Opposition stormed out of the Assembly in protest against what it termed the present Government’s inept handling of the power crisis. An adjournment motion on the issue was moved by former Electricity Minister Sri. 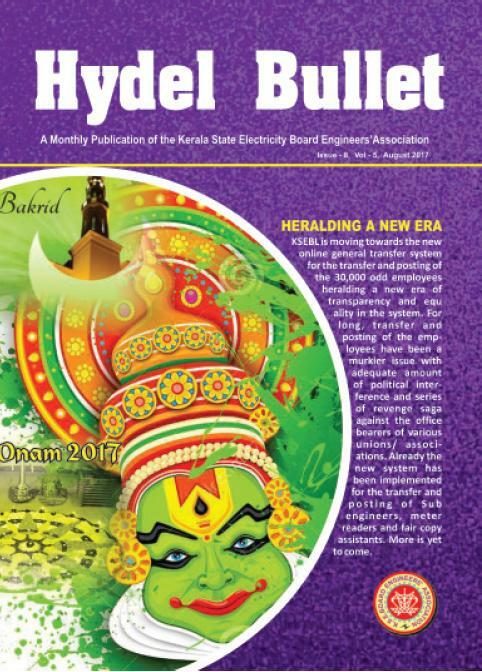 A K Balan. 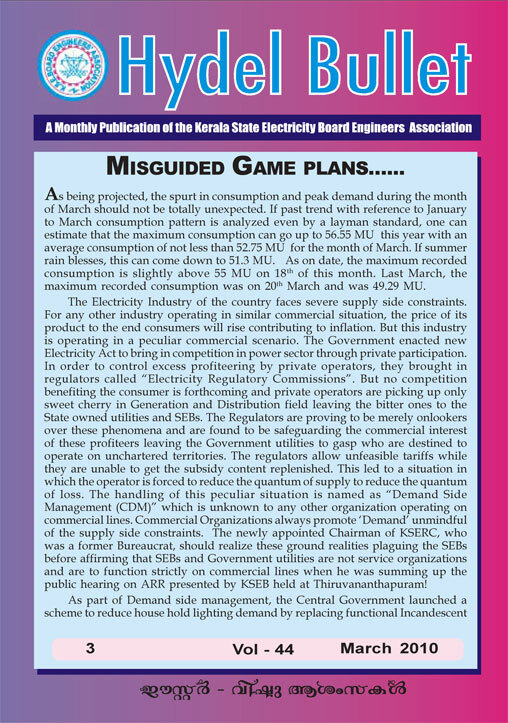 According to the former Minister, mismanagement by the KSEB had forced imposition of the burden of a thermal power surcharge and an unannounced load shedding upon the consumers. 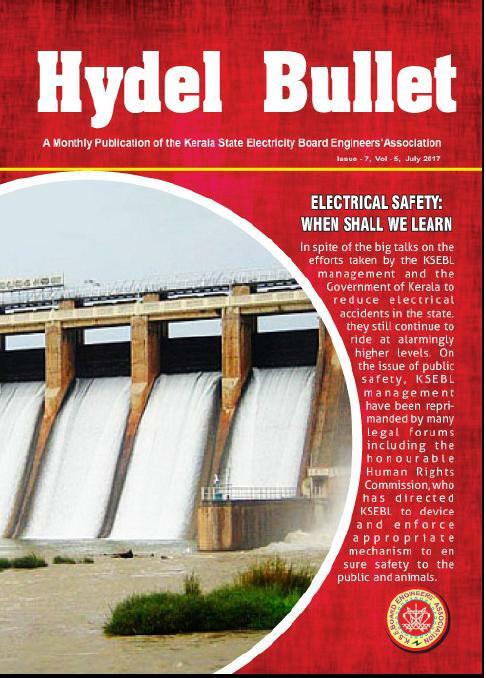 The Government could have done without the surcharge – 25 paisa per unit collected from October 1 – as the KSEB had a revenue surplus of Rs 22 crore, he argued. 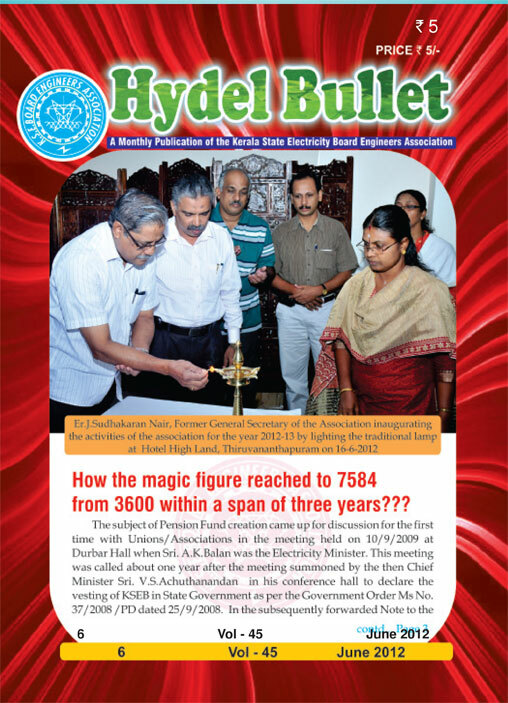 Quite promptly, Electricity Minister Sri. 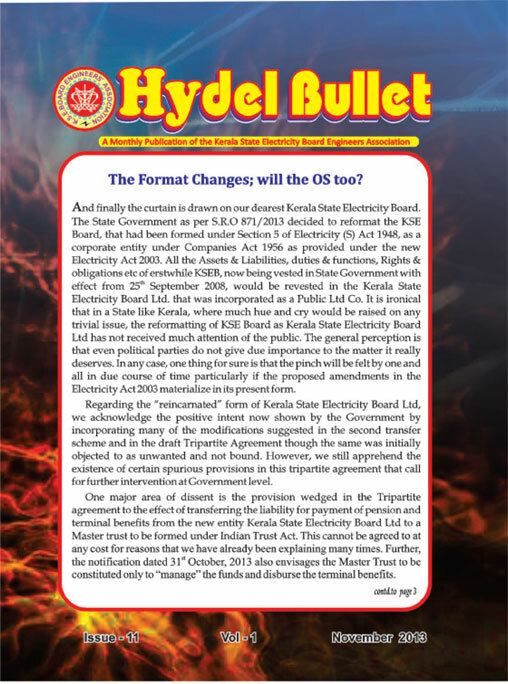 Aryadan Mohammed replied that the proposal for imposing thermal fuel surcharge was moved by the previous LDF Government, when Sri.Balan himself was the Electricity Minister. 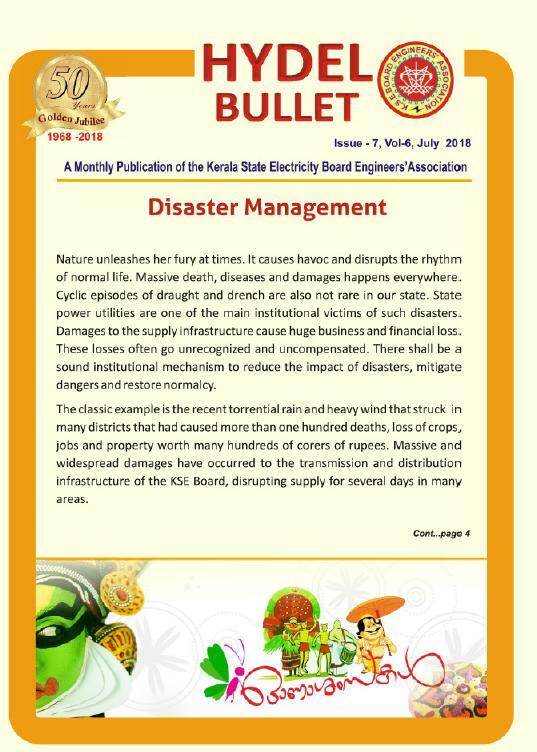 Hundred days are over since the installation of new Government and whatever programme has been set as 100 day programme in KSEB is nothing but a bracketed schedule of activities that has already been going on here. 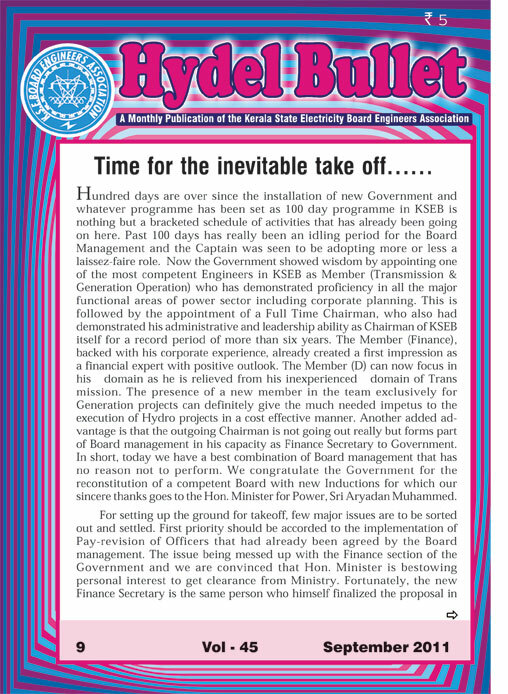 Past 100 days has really been an idling period for the Board Management and the Captain was seen to be adopting more or less a laissez-faire role. 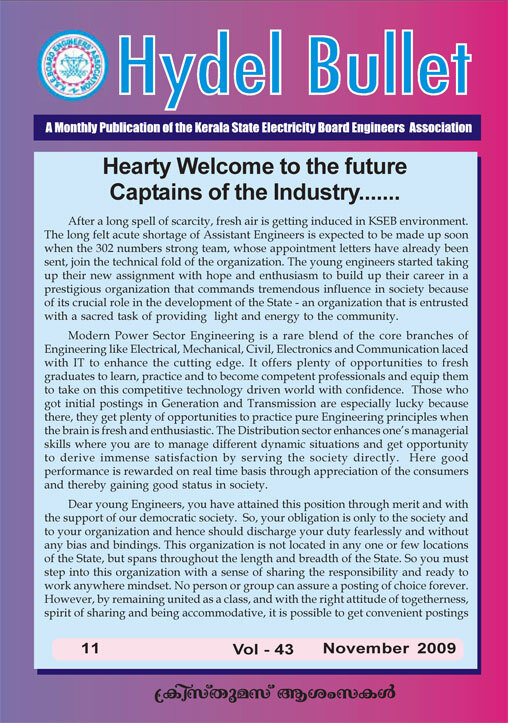 Now the Government showed wisdom by appointing one of the most competent Engineers in KSEB as Member (Transmission & Generation Operation) who has demonstrated proficiency in all the major functional areas of power sector including corporate planning. 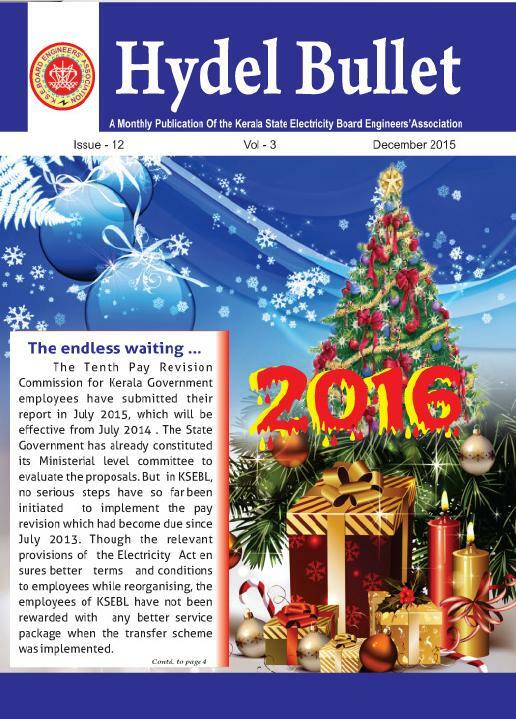 T he revision in pay and allowances due from 2008 has been implemented for the workmen category as early as 2/2011.However the process for implementing the same for the Engineers and officers has not yet reached the final stages. 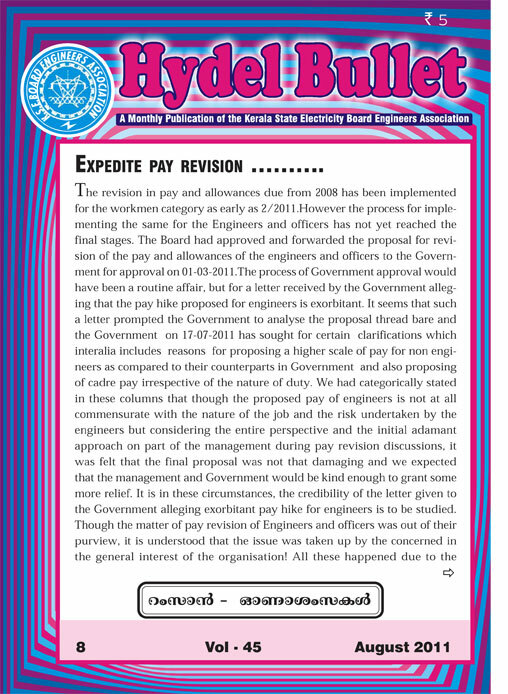 The Board had approved and forwarded the proposal for revision of the pay and allowances of the engineers and officers to the Government for approval on 01-03-2011. 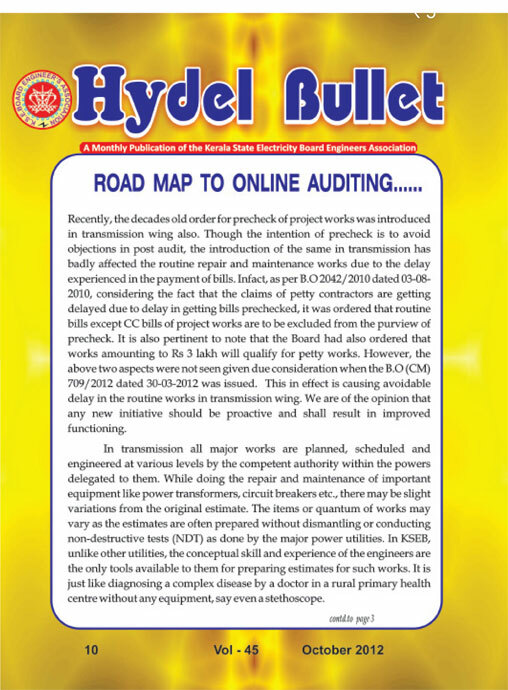 The revision in pay and allowances due from 2008 has been implemented for the workmen category as early as 2/2011.However the process for implementing the same for the Engineers and officers has not yet reached the final stages. 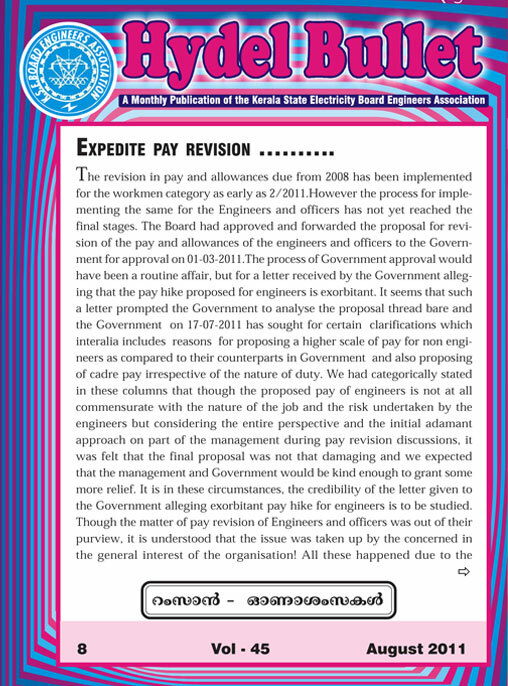 The Board had approved and forwarded the proposal for revision of the pay and allowances of the engineers and officers to the Government for approval on 01-03-2011.The process of Government approval would have been a routine affair, but for a letter received by the Government alleging that the pay hike proposed for engineers is exorbitant. whatever be the amount of compensation given. 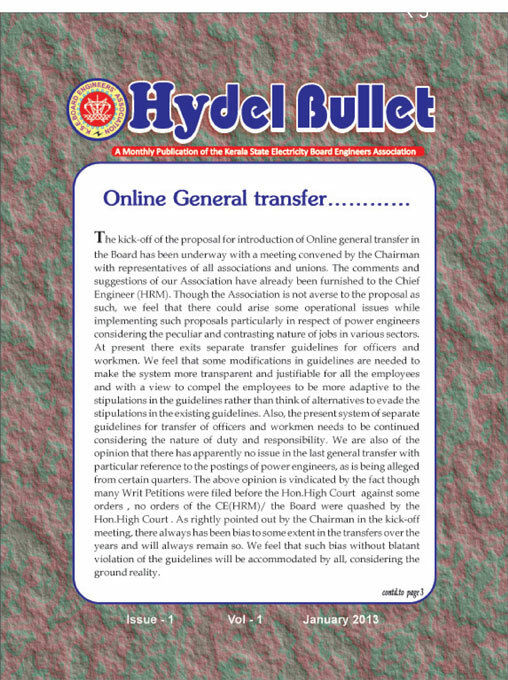 The subsequent events demonstrated that the so-called approved Generation plan remains in paper only. 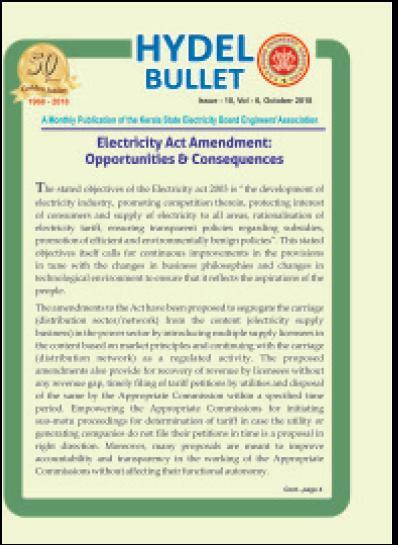 Within a week after the issuance of the B.O, the BDPP has to generate 621000 kWh of electricity on 21st and 15000 kWh on 22nd in spite of the fact that in many areas undeclared load shedding was also to be resorted to. 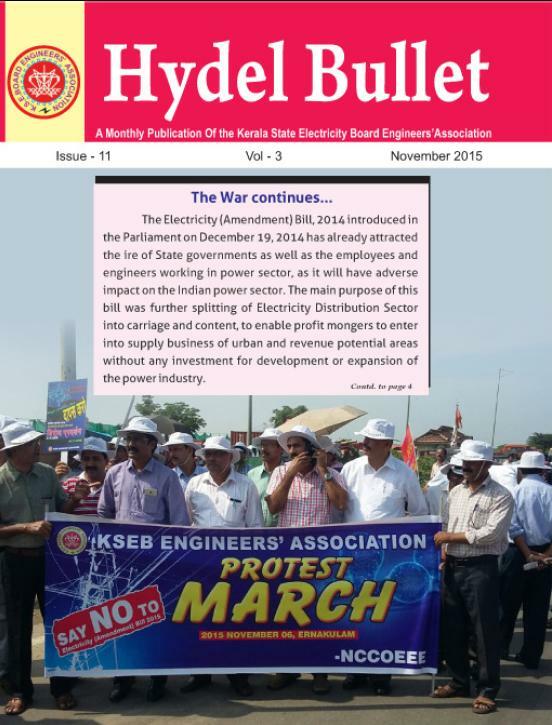 On 23rd, the prejudiced attempt not to operate the BDPP to justify the generation plan ended in declared load shedding. 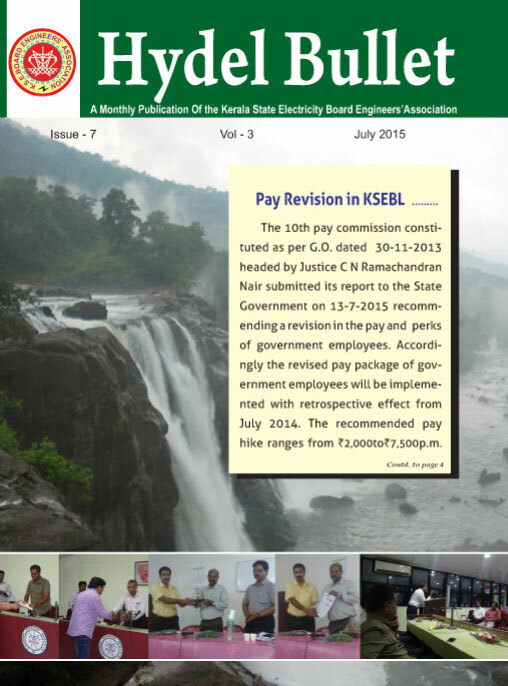 When there was just about forty three days to go for the notification of Assembly election, the Minister invited the Union & Association representatives and informed his desire to give two pay-revisions in his tenure, a task that was seemingly impossible if the historical duration of collective bargaining in KSEB was any indicator. 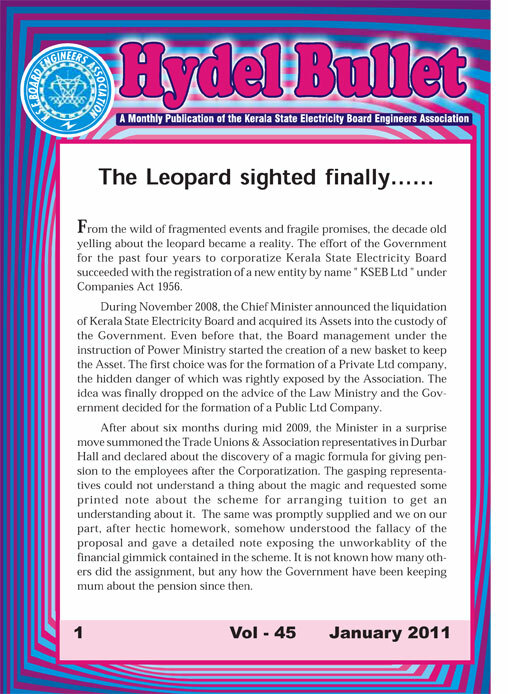 From the wild of fragmented events and fragile promises, the decade old yelling about the leopard became a reality. 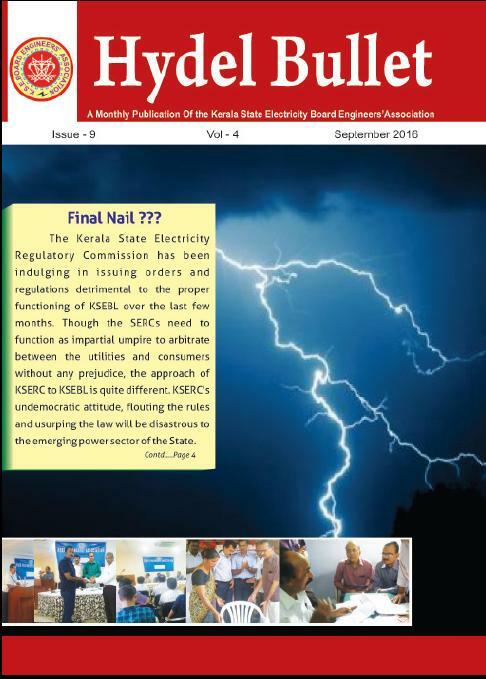 The effort of the Government for the past four years to corporatize Kerala State Electricity Board succeeded with the registration of a new entity by name ” KSEB Ltd ” under Companies Act 1956. Scientists say that the Work done is equal to Force applied multiplied by the Distance travelled. No matter the quantum of force one applies, if he fails to move the things a bit ahead, the work done would be reduced to zero! 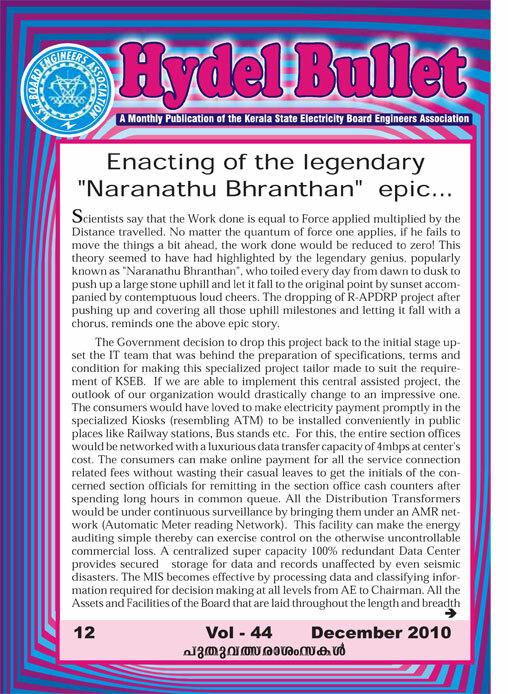 This theory seemed to have had highlighted by the legendary genius, popularly known as “Naranathu Bhranthan”, who toiled every day from dawn to dusk to push up a large stone uphill and let it fall to the original point by sunset accompanied by contemptuous loud cheers. The country seems to be in a continued sporty mood with the successful conducting of Commonwealth Games. Though not at the same rate of Delhi, Indian Athletes are faring well in Asian Games too at Guangzhou and we are proud that four sports persons from KSEB are selected to the teams representing India. 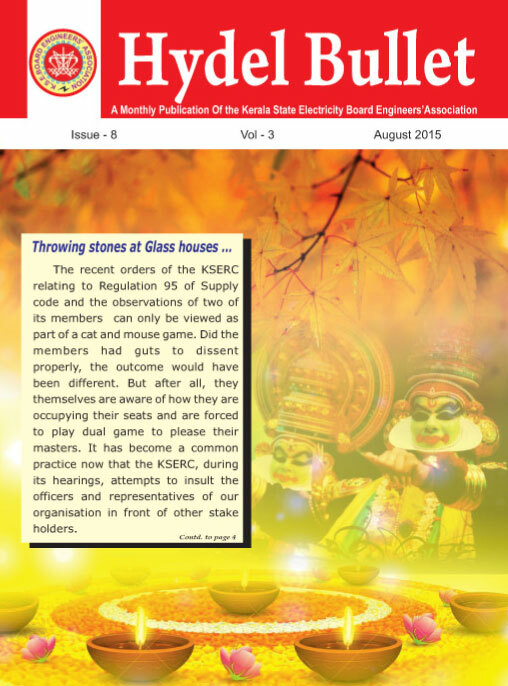 The Association congratulates them and wishes them to bring victory to the country and to KSEB. 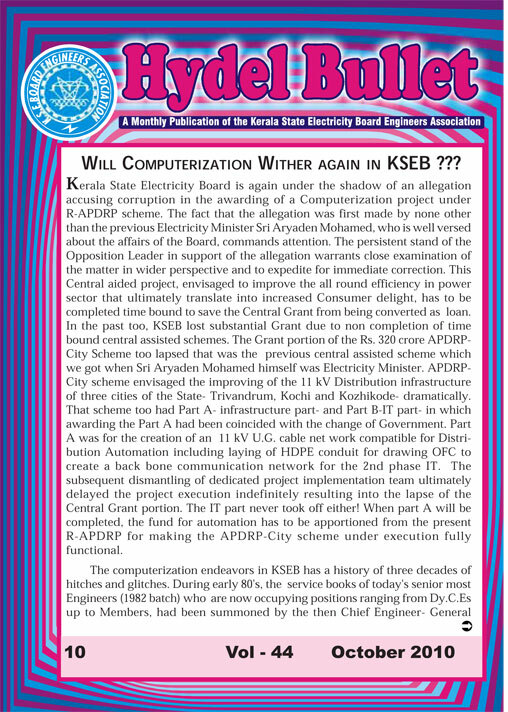 WIIL COMPUTERIZATION WITHER AGAIN IN KSEB ?? 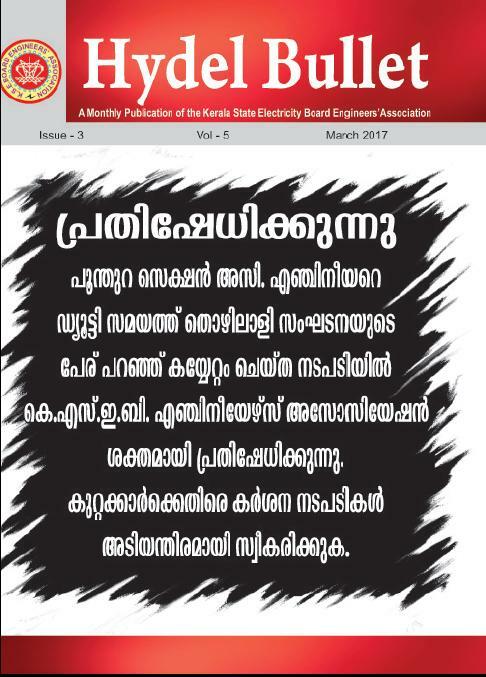 Kerala State Electricity Board is again under the shadow of an allegation accusing corruption in the awarding of a computerization project under R-APDRP scheme. The fact that the allegation wasfirst made by none other than the previous Electricity Minister Sri Aryaden Mohammed, who is well versed about the affairs of the board, commands attention. 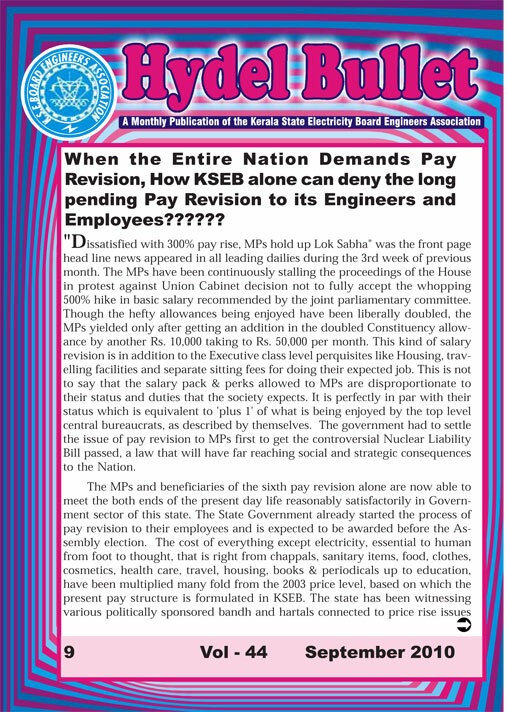 When the Entire Nation Demands Pay Revision, How KSEB Alone can deny the long pending Pay Revision to its Engineers and Employees????? 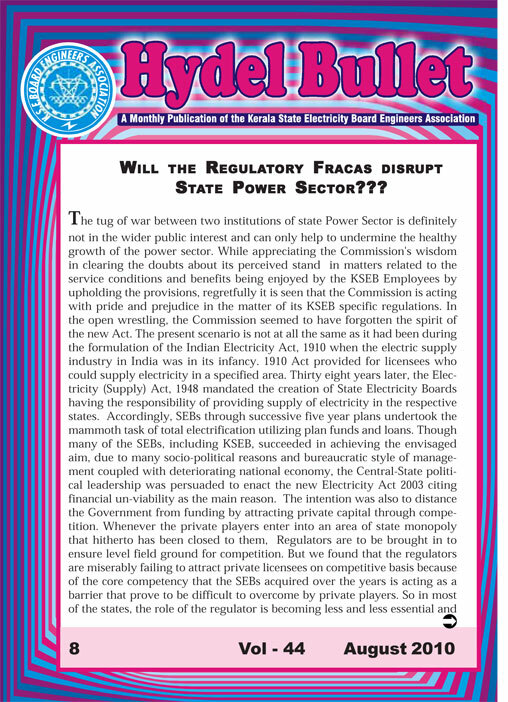 The tug of war between two institutions of state power sector is defenitely not in the wider public interest and can only help to undermine the healthy growth of the power sector.While appreciating the Company’s wisdom in clearing the doubts about its precieved stand in matters related to the service conditions and benefits being enjoyed by the KSEB Employees by upholding the provisions, regretfully it is seen that the commision is acting with pride and prejudice in the matter of its KSEB specific regulations. 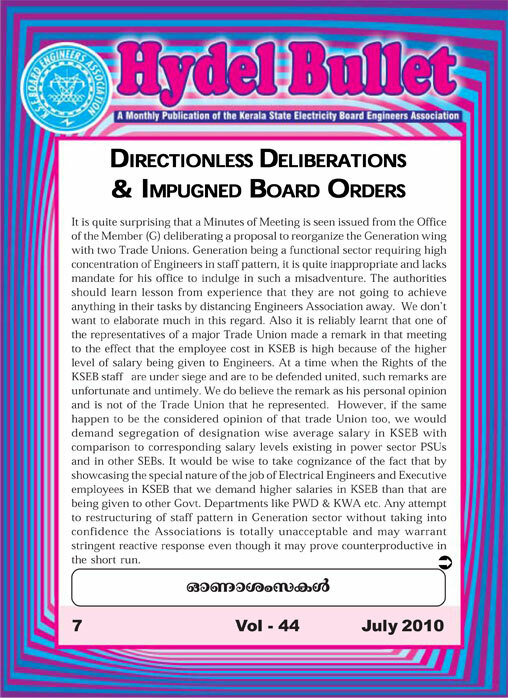 It is quite surprising that a Minutes of Meeting is seen issued from the Office of the Member (G) deliberating a proposal to recognise the Generation wing with two Trade Unions. 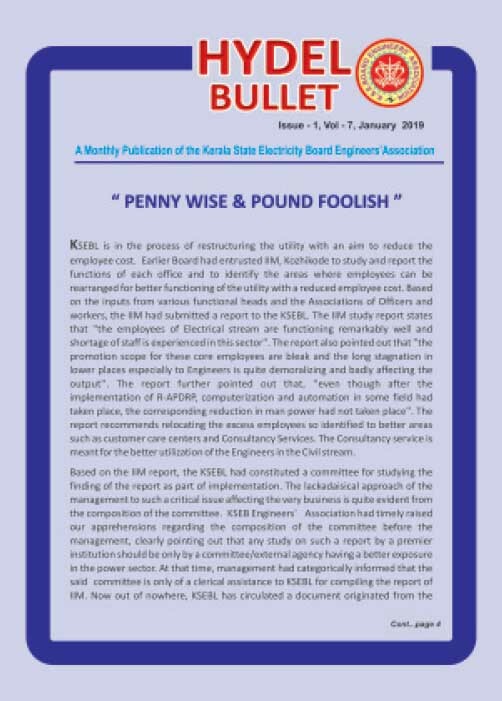 Generation being a functional sector requiring high concentration of Engineers in Staff Pattern, it is quite inappropriate and lacks mandate for his office to indulge in such a misadventure. In the recent orders from KSERC, whether they are on the truing up of audited accounts or on ARR & ERC, an unholy collusion angle with a very rich lobby that represents only less than 0.05% of the vast consumer base, is clearly visible. 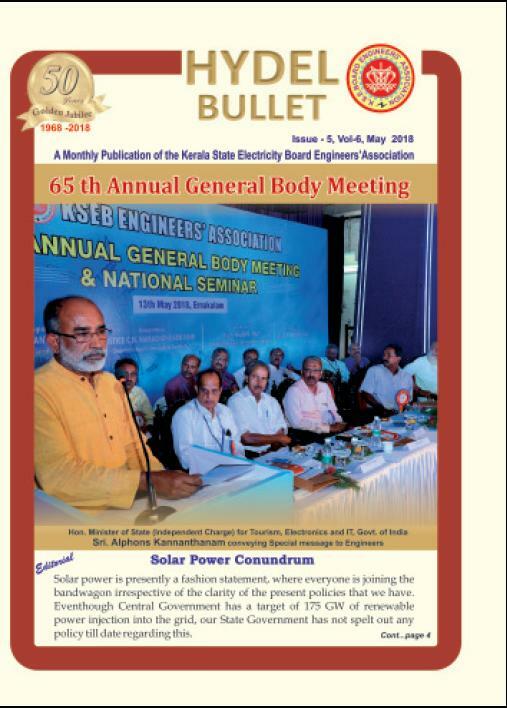 That is what we have to say after concluding the deliberations of the May 9, F. N. session seminar on’Post Compenhagen Challenges to Kerala Power Sector’ in the wake of the global effort to mitigate the heating up of our planet. 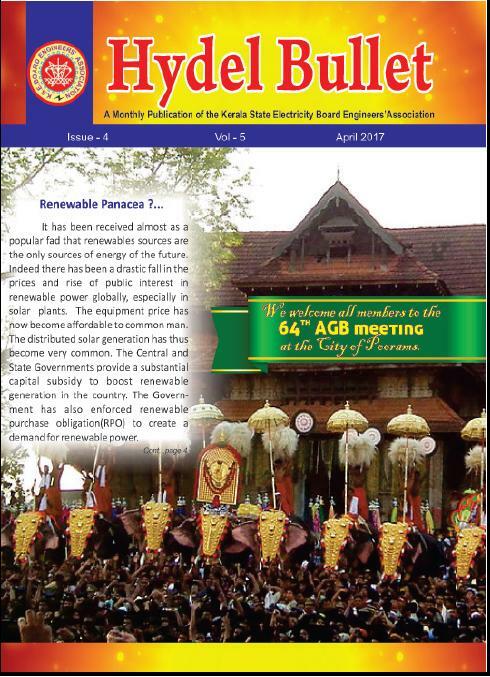 The Engineers Association took birth on the auspicious day on April 25th, 1954 in the central hall of old government Engineering college, Trivandram. 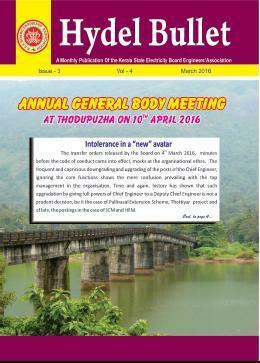 This year on 9th May, we are proudly convening the 57th Annual General Body of the Association at Caldian Centre, Trichur. 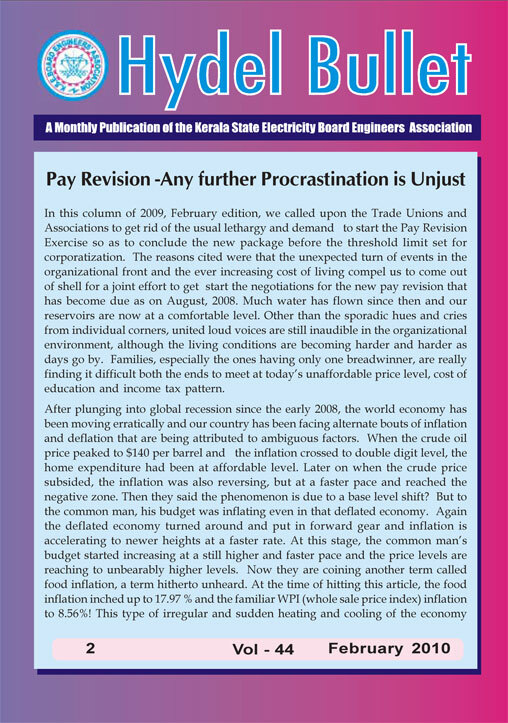 In this coloumn of 2009, February edition , we called upon the trade unions and Associations to get rid of the usual lethargy and demand to start the pay revision Exercise so as to conclude the new package before the threshold limit set for corporatization. 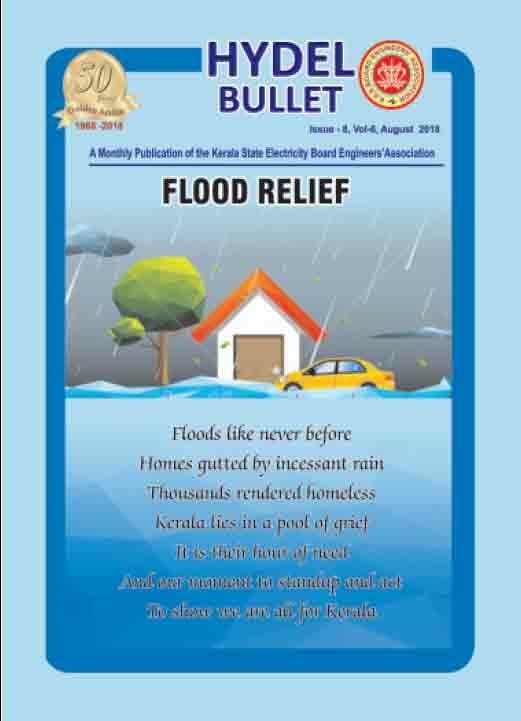 Food ,Clothing and Shelter have been considered as the basic needs of Humans for long. But today, if anyone asks the modern age common man, he will surely add electricity as the forth basic need of the present day life style. 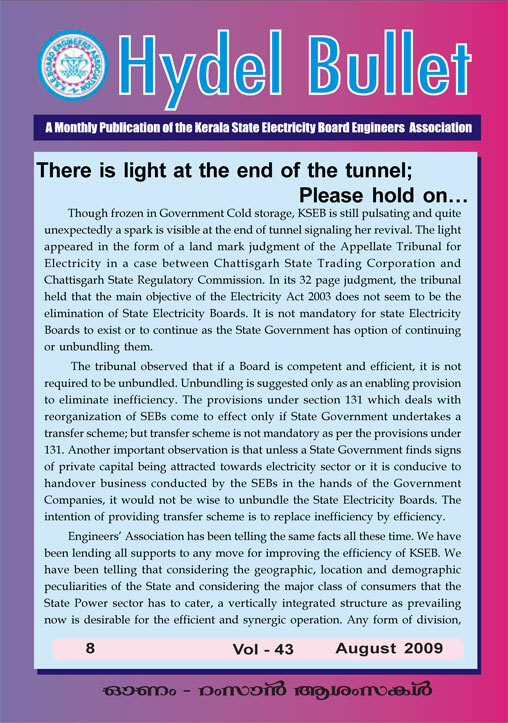 After a long spell of scarcity, the fresh air is getting induced in KSEB environment. 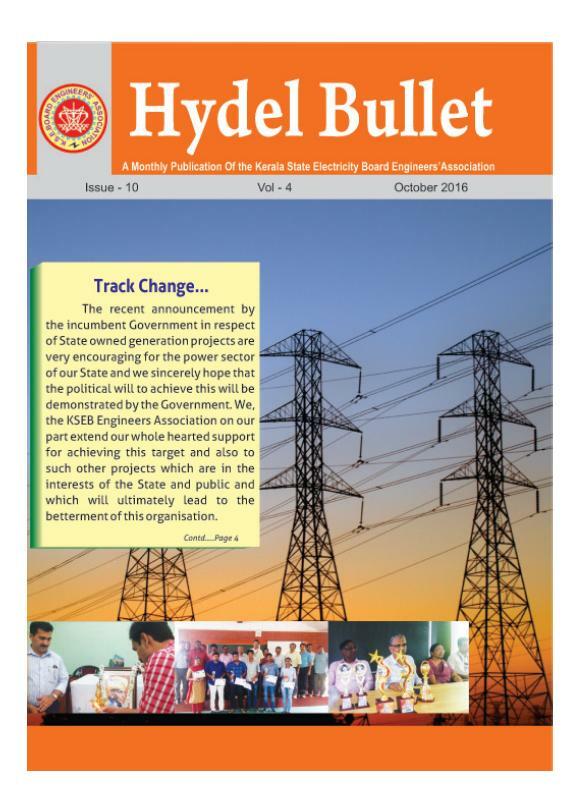 The long felt acute shortage of Assistant Engineers is expected to be made up soon when the 302 numbers strong team , whose appointment letters have already been sent, join the technical fold of the organisation. 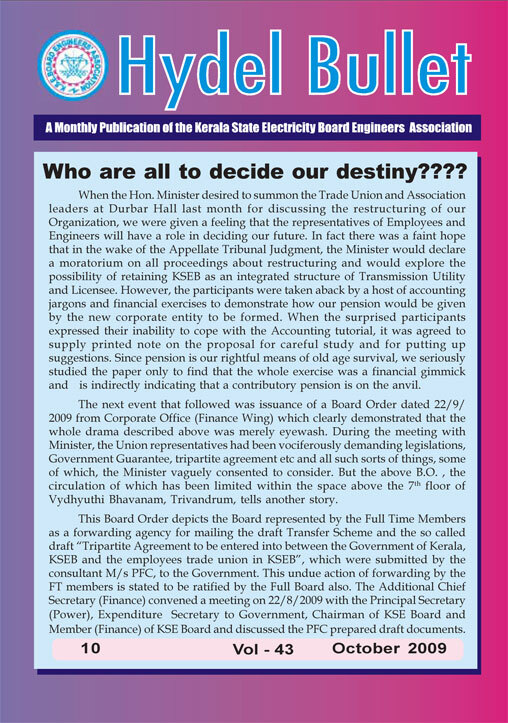 When the Hon.Minister desired to summon the Trade union and association leaders at durbar hall last month for discussing the restructuring of our organisation, We were given a feeling that the representatives of Employees and Engineers will have a role in deciding our future. 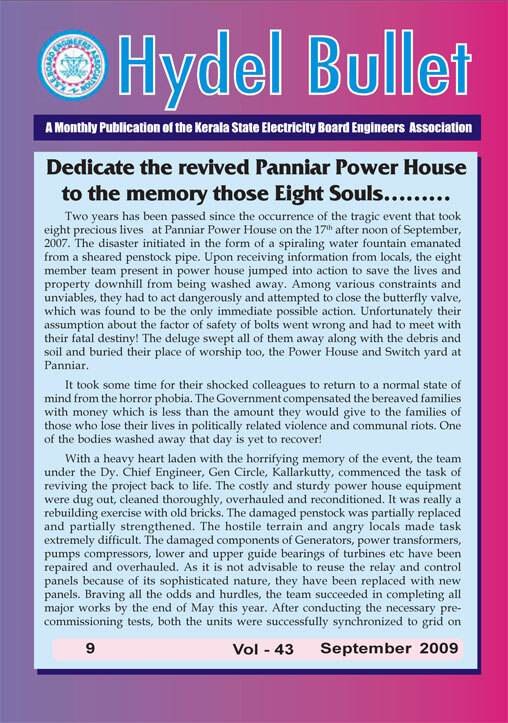 Two years has been passed since the occurance of the tragic event that took eight precious lives at Panniar power house on the 17th afternoon of september, 2007. 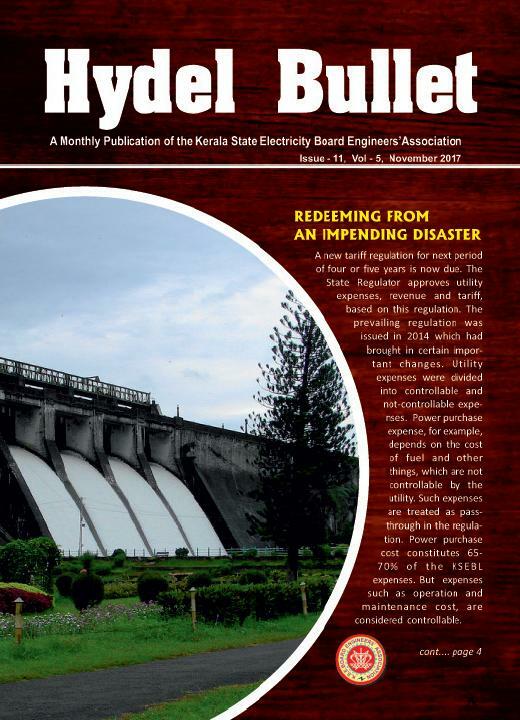 The disaster initiated in the form of a spiraling water fountain emanated from a sheared penstock pipe. 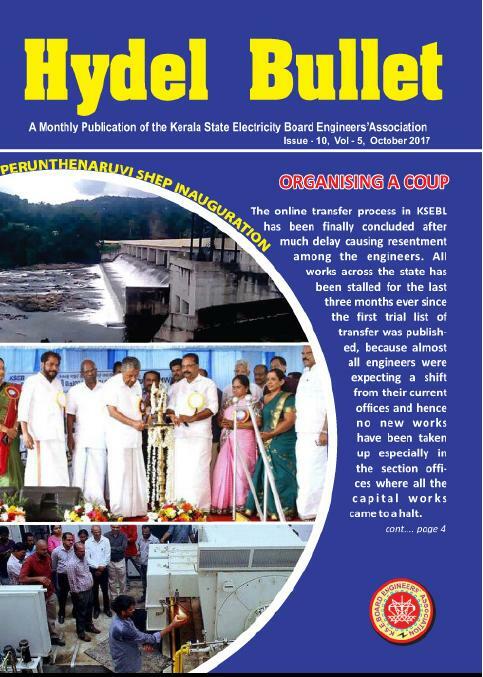 Though frozen in government cold storage, KSEB is still pulsating and quite unexpectedly a spark is visible at the end of tunnel signalling her revival. 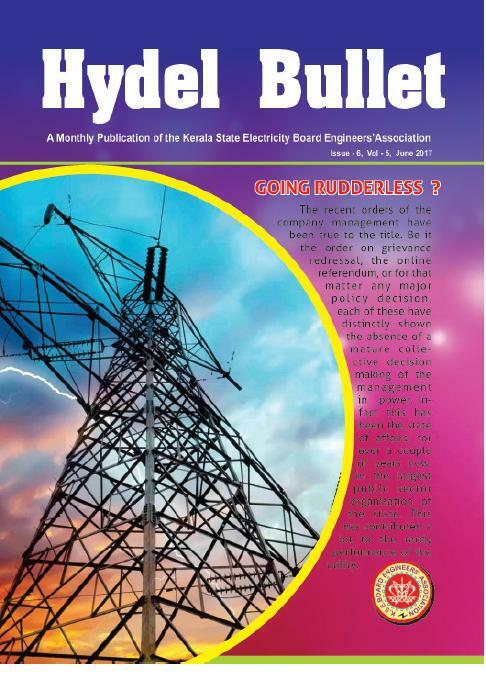 The light apperared in the form of a land mark judgement of the Appelette tribunal for electricity in a case between Chattisgarh State trading corporation Chattisgarh state regulatory commission.